The Johnson group explores a variety of topics in synthetic macromolecular chemistry and surface chemistry. 4 April 2019: Gaby and Hung's paper on ROMP of polyoxazoline macromonomers published online in ACS Macro Letters. Congrats on this nice work! Click on the image below to read the paper. 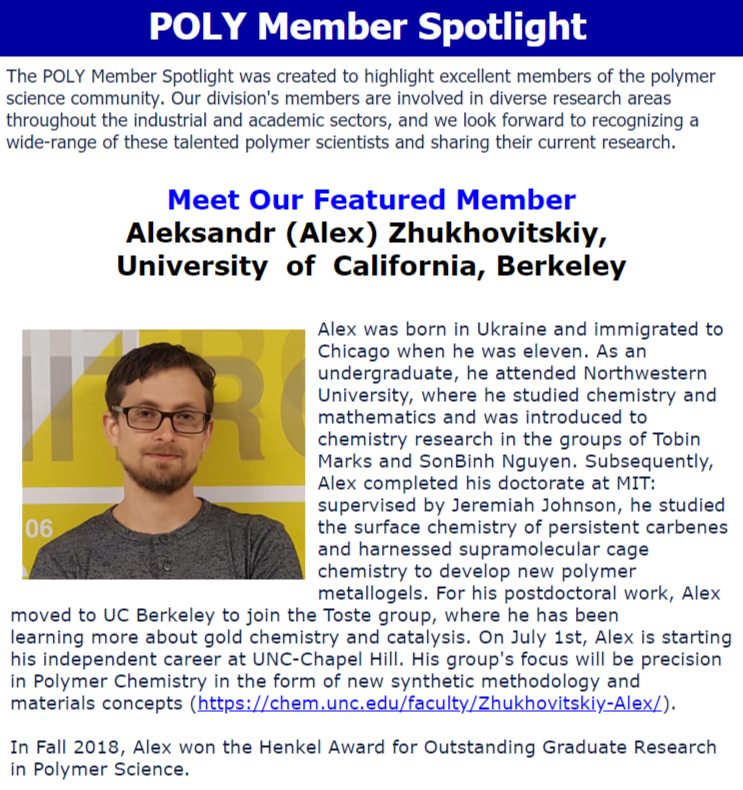 21 March 2019: Former graduate student Alex Zhukhovitskiy is featured in the ACS Polymer Division (POLY) Member Spotlight. Click on the image below to read the highlight. 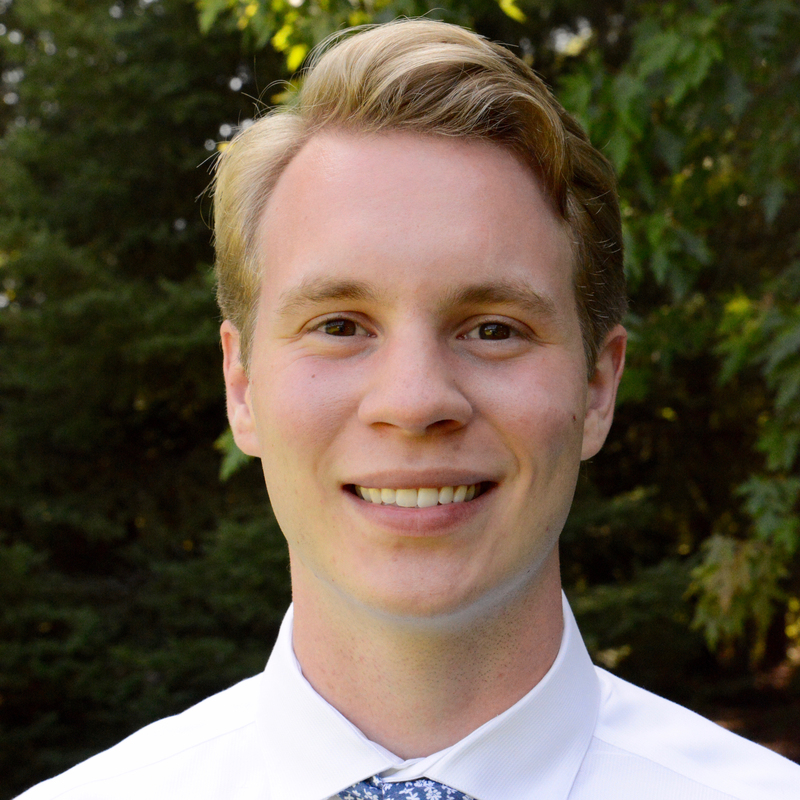 11 March 2019: Congratulations to Matthew Golder for accepting a tenure-track position in the Department of Chemistry at the University of Washington! Click on the image below to read the announcement on the UW website. 9 March 2019: Samantha selected to receive a 2019 Misrock Postdoctoral Fellowship award for her proposed work on using brush-arm star polymers for CRISPR/Cas-9-mediated cancer therapy. Congrats to Samantha for this very prestigious honor! 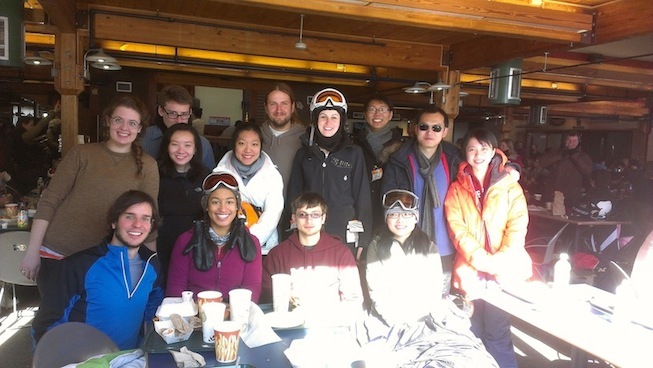 5 March 2019: The somewhat annual Johnson Group Ski Trip to Killington, VT happened from Feb 19-21. Thanks to Samantha, Nate, and Shannon for organizing the trip, Samantha and Manuel for cooking great dinners, and Julia for designing the logo for the group sweatshirt (see below). A great time was had by all. Looking forward to next year! 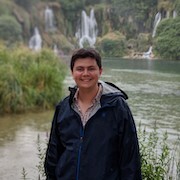 4 March 2019: Congratulations to former graduate student Alex Zhukhovitskiy for accepting a tenure-track position in the Department of Chemistry at the University of North Carolina-Chapel Hill! Click on the image below to read the announcement on the UNC website. 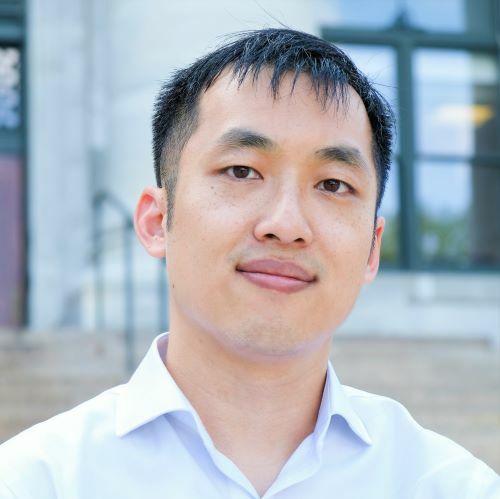 18 February 2019: Former postdoc Junpeng Wang begins his independent career at the University of Akron! Click here to visit the Wang Group website. 13 February 2019: Yuwei wins the Extraordinary Prize of the Chinese Government Award for Outstanding Self-Financed Students Abroad. He is one of only 10 such awardees worldwide. Congrats to Yuwei for this very prestigious honor! Click here to read the official announcement in Chinese (Yuwei is listed on the 7th row). 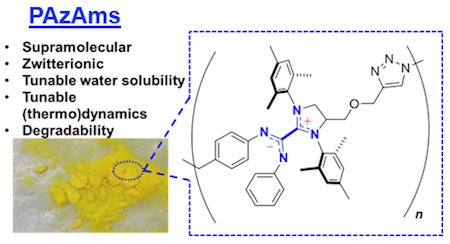 8 February 2019: Jessica's paper on trithiocarbonate-mediated photo-controlled radical polymerization of acrylates and acrylamides under ambient conditions (e.g., open vials) and with no additives published online in Polymer Chemistry. This work represents a significant advance toward our ultimate goal of enabling practical Living Additive Manufacturing (see ACS Cent. Sci. 2017, 3, 124). Congrats to Jessica for this excellent work! Click on the image below to read the paper. 8 February 2019: Collaborative paper with the Olsen group on a new and improved version of Real Elastic Network Theory published online in Macromolecules. Congrats to Tzyy-Shyang! Click on the image below to read the paper. 17 December 2018: Michelle's paper on bidentate NHC-thiolate ligands for gold nanorods is highlighted in Nature Chemistry News & Views! Click here to read the highlight. 15 December 2018: Welcome to our four new graduate students Allie Sourakov, David Lundberg, Keith Husted, and Michael Stolberg! Check out the group page for more information about them. 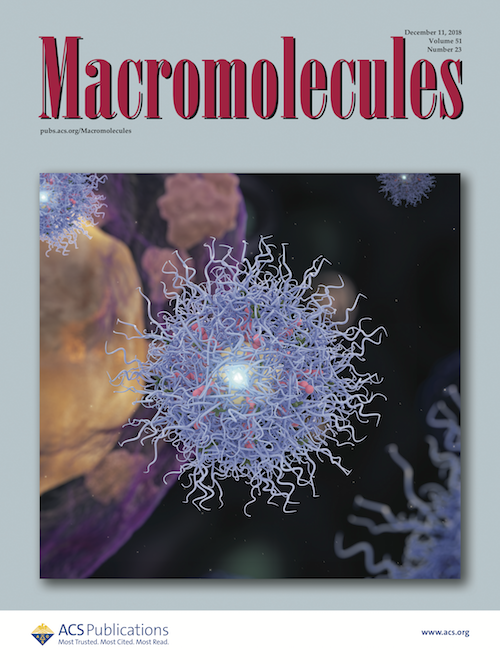 11 December 2018: Matt's paper on "ROMP-out" highlighted on the cover of the latest issue of Macromolecules. 14 November 2018: Matt's paper on "ROMP-out" published online in Macromolecules. Click on the image below to read the paper. Congrats Matt! 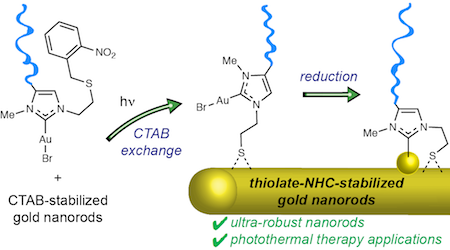 12 November 2018: Michelle's paper on the synthesis of exceptionally robust bidentate NHC-thiolate-stabilized gold nanorods published online in Nature Chemistry. Congrats Michelle! 5 November 2018: Former visting student Dr. Manuel Hartweg re-joins the group as a postdoc. Welcome back, Manuel! 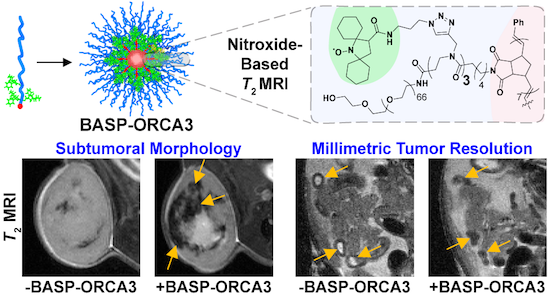 18 October 2018: Hung's paper on triply-loaded nitroxide BASPs for metal-free magnetic resonance imaging of tumors published online in ACS Nano. Congrats to Hung and thanks to all of our collaborators for this great work! Click on the image below to read the paper. 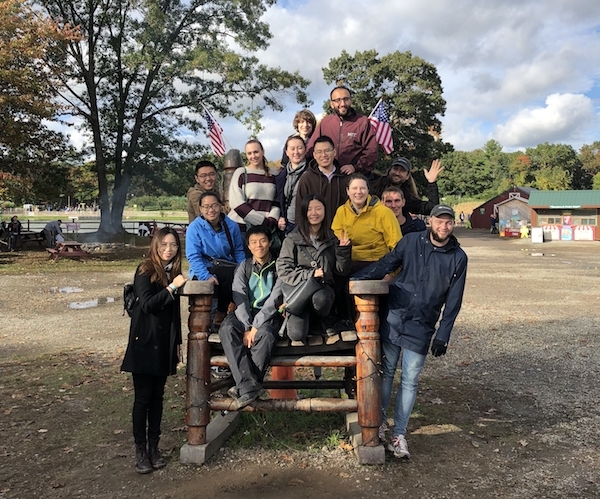 13 October 2018: The group and friends visited Connor's Farm for festive fall activities including apple picking, corn mazing, and cider donut eating! 10 October 2018: Yuwei's paper on harnessing the leaving groups in KAT ligation amide bond forming reactions to program the topology of polymer netwoks in a chemically traceless manner is published online in JACS. 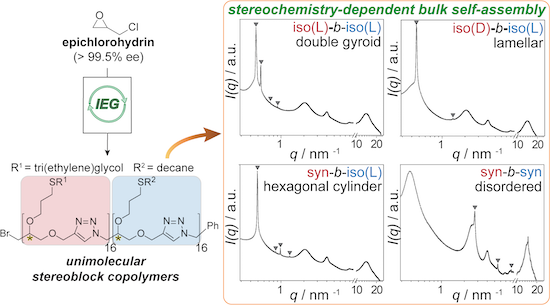 Congrats to Yuwei and thanks to the Bode group at ETH for this fruitful collaboration! Click on the image below to read the paper. 9 October 2018: Yoshiki and Ryoichi's paper on the impact of PEO architcture on lithium ion conductivity published online in Journal of Polymer Science, Part A. Congrats to Yoshiki and Ryoichi for this excellent work! Click on the image below to read the paper. 17 September 2018: Jeremiah receives an Arthur C. Cope Scholar Award! Click here to see the full list of ACS national award winners. 15 September 2018: We are thrilled to be part of a new NSF Center for Chemical Innovation. Our center, called the "Center for the Chemistry of Molecularly Optimized Networks," or "MONET" for short, consists of researchers from the Craig and Rubinstein groups at Duke University, the Kalow group at Northwestern University, and the Johnson and Olsen groups here at MIT. Together, we seek to elucidate molecular design principles that will enable finely tuned control over the properties of polymer networks for emerging applications. Click here or on the image below to visit the MONET website. 11 September 2018: Dr. Samantha Kristufek joins the group as a new postdoc! 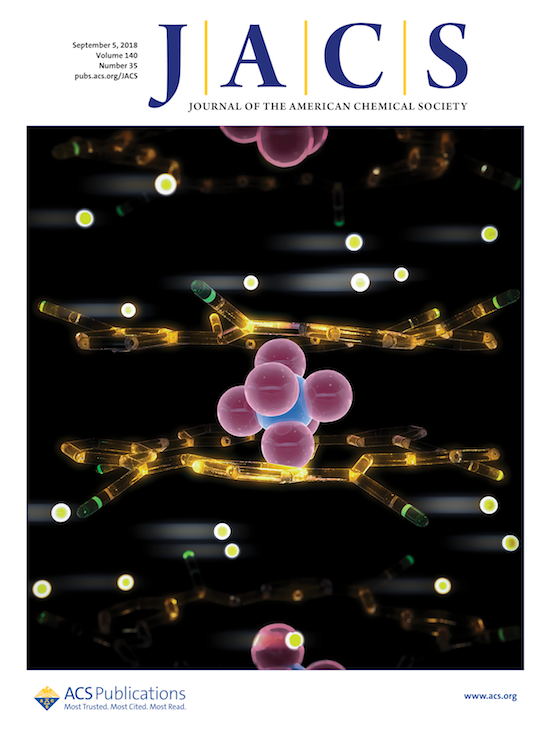 5 September 2018: Bo's paper on the role of selective anion binding in controlling litihium ion conductivity and transference number highlighted as a supplementary cover in JACS. Click on the image below to read the paper. 23 August 2018: Wenxu's paper on LiAlH4 reduction of polymethyl(meth)acrylate-based block copolymers to generate novel hydroxy-based block copolymers with exceptionally high chi values published online in Macromolecules. Congrats Wenxu for this great work! Click on the image below to read the paper. 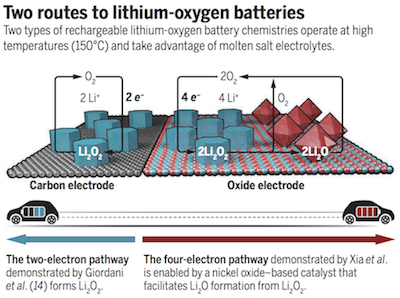 23 August 2018: Shuting's perspective article on an exciting development in lithium-oxygen battery chemistry from Nazar and coworkers published online in Science. Great work Shuting! Click on the image below to read the paper. 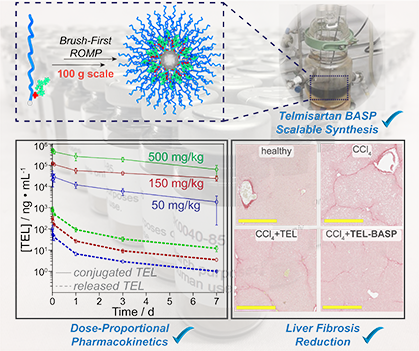 20 August 2018: Matt and Jenny's paper on brush-arm star polymer (BASP)-based telmisartan prodrugs for liver fibrosis therapy appears online in Nature Biomedical Engineering! Congrats to Matt, Jenny, and everyone on the team for this great work! 13 August 2018: Editorial article on polymers at the interface with biology published online in Biomacromolecules. Special thanks to Tim Deming and Harm-Anton Klok for including our work. 25 July 2018: Dr. Jessica Lamb receives an NIH F32 Postdoctoral Fellowship. Congrats Jessica! 18 July 2018: Yuwei's paper on photoswitching the topology of polymer metal-organic cage (polyMOC) gels published online in Nature! Congrats to Yuwei for this awesome work! Click on the image below to read the paper. 17 July 2018: Bo's paper on using anion recognition to control the conductivity of lithium in solution is published in JACS. In this paper, Bo convincingly shows how the compound cyanostar, which is a macrocycle that selectively binds PF6 anions in a 2:1 ratio, can be used to increase the conductivity and transference number of lithium in a low dielectric medium (THF). This work was made possible by a great collaboration with the Shao-Horn and Flood labs at MIT and University of Indiana, respectively. Congrats to Bo and the whole team! Click on the image below to read the paper. 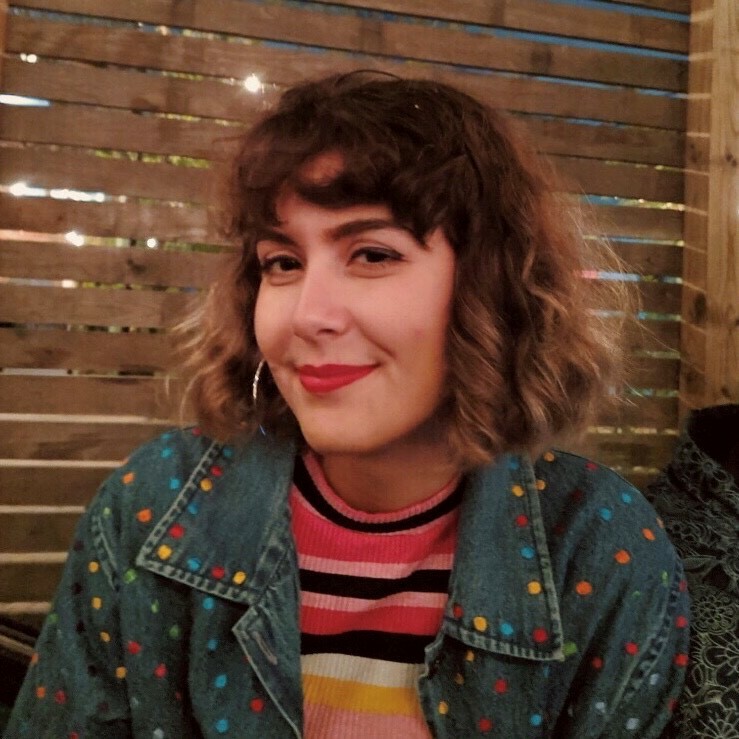 10 July 2018: Welcome back visiting undergraduate student Leticia Costa who joins us again this summer! 1 July 2018: Visiting undergraduate Oscar Gonzalez joins for the summer from Texas A+M University. Visiting PhD student Martin Lahn Henriksen joins from Aarhus University in Denmark. 7 June 2018: Collaborative paper with the Ross and Alexander-Katz groups on the self-assembly of polystyrene-branch-polydimethylsiloxane Janus bottlebrush copolymers appears online in Nano Letters. Congrats to the team for this great work! Click on the image below to read the paper. 1 June 2018: Junpeng Wang will start his independent career as an Assistant Professor at the University of Akron in the Department of Polymer Science in January 2019. 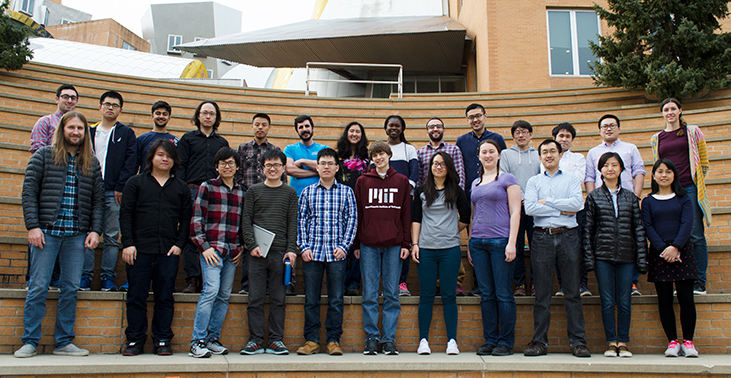 Click here to check out the Wang Lab website! 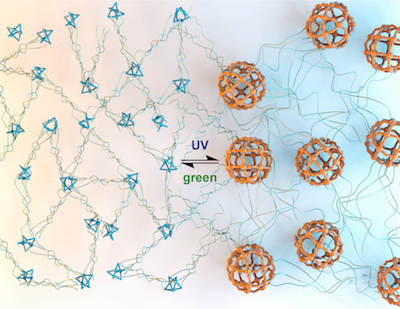 18 May 2018: Collaborative paper with the Zhong and Osuji groups on the self-assembly of branched macromonomers and Janus bottlebrush polymers with oligomeric sidechains appears online in Angewandte Chemie. 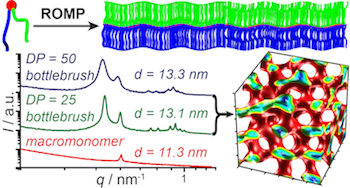 In this work, we show that Janus bottlebrush polymers with very short sidechains can self-assemble to form classical block copolymer morphologies with very small (sub-10 nm) domain sizes. Most importantly, the mechanical properties of the resulting materials are determined by the bottlebrush backbone length rather than the block copolymer sidechain length, which means that our materials can be mechanically robust despite their very small domain sizes. Congrats to Zi-Hao and the whole team for this great work! Click on the image below to read the paper. 15 May 2018: Jeremiah becomes an Associate Editor of the journal Polymer Chemistry! Click here to read the official announcement on the Polymer Chemistry blog. 11 May 2018: Jeremiah named co-recipient of the 2018 Biomacromolecules/Macromolecules Young Investigator Award! 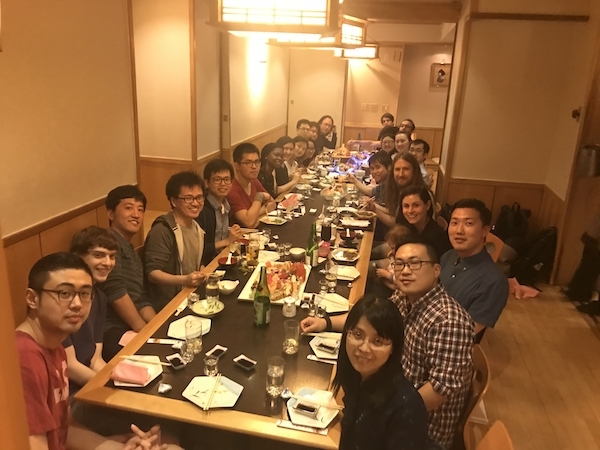 5 May 2018: The group convened at Fugakyu to enjoy sushi boats and to say goodbye to Dr. Yoshiki Shibuya and welcome Dr. Masamichi Shirakura and Dr. Teruhiko Saito. Best of luck in your future career at L'Oréal Yoshiki. We'll miss you! 1 May 2018: Welcome to visiting scientists Dr. Masamichi Shirakura from Otsuaka Pharmaceuticals and Dr. Teruhiko Saito from Panasonic! 30 April 2018: We are thrilled to be part of a Stand Up to Cancer "Dream Team" focused on the development of early diagnostic and therapeutic tools for multiple myeloma (MM) patients. In this project, we will work with clinicians to design targeted MRI contrast agents for identification of early-stage MM. We will combine these diagnostic tools with macromolecular prodrug therapies to enable early disease intervention. Looking forward to working with the Ghobrial (Dana-Farber Cancer Institute) and Borello (Johns Hopkins University School of Medicine) labs on this exciting and impactful project! Click here to read the MIT News story about the SU2C Dream Team. Click here to read the DFCI story about the SU2C Dream Team. 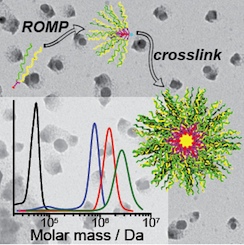 20 April 2018: Collaborative paper with the Osuji group on the self-assembly of branched macromonomers and bottlebrush polymers that contain polymer and mesogen sidechains published in Macromolecules. Congrats to Katerina and Ken for this great work! Click on the image below to read the paper. 11 April 2018: PhD student Julia Zhao orgnizes MIT's 2018 Polymer Day! 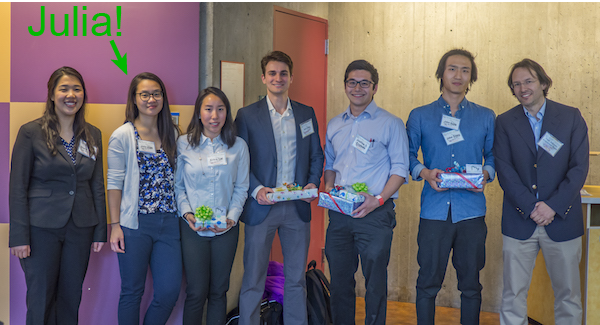 As the name suggests, Polymer Day is a day where we celebrate all things polymer-related at MIT and in the greater region. 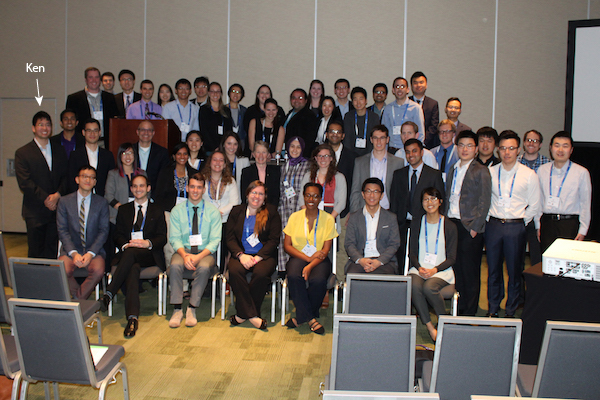 Students, post-docs, faculty, and industry representatives come from all over to learn about and discuss cutting edge research in polymer science and engineering. Thanks to Julia for making this event a great success! 11 April 2018: Former PhD student Michelle MacLeod named a 2018 Change Maker by MIT's Violence Prevention and Response, Title IX, and Bias Response Offices! Michelle's efforts to raise awareness of sexual harassment and create an inclusive environment for all will have a longlasting impact on our Department and MIT as a whole. Congrats Michelle for this greatly deserved award! Click here to read the MIT News story about this award. 10 April 2018: PhD student Yuwei Gu featured in several exciting venues! 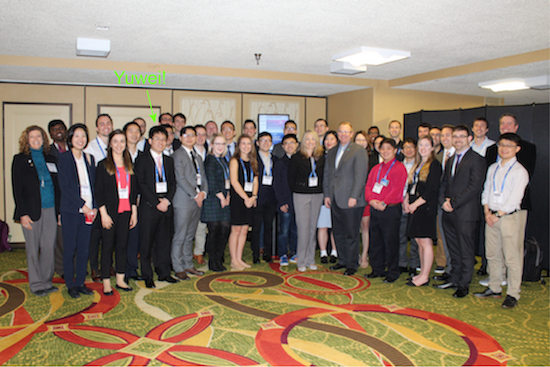 First, he presented at the Excellence in Polymer Graduate Research Symposium at the ACS National Meeting in New Orleans (top image below), where he also won a Division of Polymer Chemistry (POLY) Outstanding Poster Award. The latter led to him being featured in the latest POLY Division spotlight (bottom image below). Congrats to Yuwei for the well-deserved recognition! 26 March 2018: Nolan's paper describing a new class of main-chain-zwitterionic supramolecular polymers, called poly(azolium amidinate)s or "PAzAms," published online in Macromolecules. These fascinating new polymers are derived from the formation of N-heterocyclic carbene (NHC)-carbodiimide (CDI) adducts. Nolan shows that it is possible to finely tune the (thermo)dynamics of pZAms to enable their controlled depolymerization and morphing between different PAzAm structures. Congrats Nolan! Click on the image below to read the paper. 26 March 2018: Collaborative paper with the Shao-Horn group (MIT Mechanical Engineering) and Samsung Advanced Institute of Technology (SAIT) on the design of modular salts for battery applications published online in Energy and Environmental Science. In this work, we sought to expand the structural scope of sulfonimides, which are common components of lithium and other batteries. The famous TFSI anion is frequently used in batteries thanks to its excellent stability, but it cannot be easily chemically modified to alter its properties such as solubility and size. In this paper, we develop a new family of sulfonimides called Fluorinated Aryl Sulfonimide Tagged ("FAST") anions that can be rapidly and easily modified to generate metal salts with tunable properties. FAST salts greatly expand the number of available Li or other metal salts available for use in battery research. Congrats to the whole team, especially Mingjun and Shuting, for this great effort! Click on the image below to read the paper. 26 March 2018: Hung's paper on a scalable synthetic strategy for multivalent macromonomers is published online in ACS Macro Letters. This approach described in this paper enables the synthesis of our macromonomers in 3 total steps (2 steps longest linear sequence) in 92% yield on the 100 g scale with no chromatography. In addition, it allows us to easily incorporate multiple functionalities onto the same macromonomer, which is a gamechanger for our projects on drug delivery and imaging with bottlebrush and brush-arm star polymers. Congrats Hung! Click on the image below to read the paper. 23 March 2018: It was great to hang out with friends and family at the ACS National Meeting in New Orleans! 23 March 2018: Dr. Peyton Shieh is awarded an American Cancer Society Postdoctoral Fellowship! Congrats Peyton! 11 March 2018: Welcome to new UROP Rebecca Sloan and visting graduate student Zhihao Huang! 7 February 2018: Matt and Yivan's paper on the role of stereochemistry in the self-assembly of unimolecular block copolymers is highlighted as a supplementary cover in JACS. Click on the image below to read the paper. 5 February 2018: Junpeng's paper on counting secondary loops in end-linked polymer networks appears online in ACS Macro Letters! In this paper, Junpeng figured out a way to use a non-degradable polymer chain in the context of Network Disassembly Spectrometry (NDS) to provide the first direct measurements of the secondary loop fraction in polymer networks. Prior to this work, it was only possible to measure primary loop defects. As we continue to investigate the impact of topological defects in polymer networks, Junpeng's "NDS2.0" will be an invaluable tool. 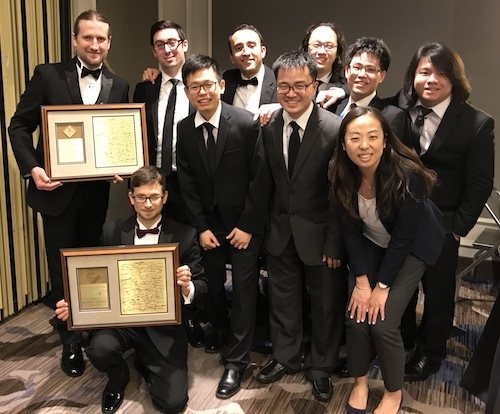 Congrats to Junpeng and the rest of the group for this great work! Click on the image below to read the paper. 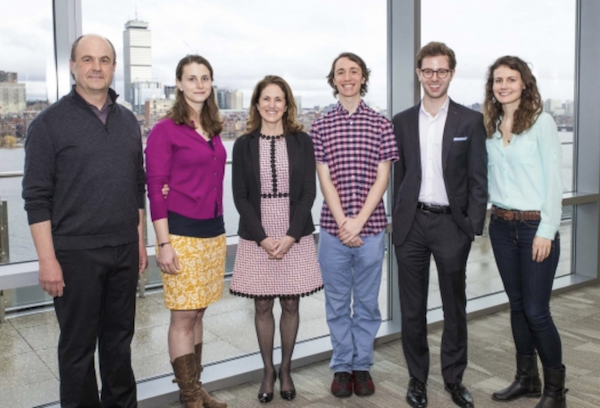 2 February 2018: New Koch Institute for Integrative Cancer Research at MIT members announced. Click on the image below for details. 23 January 2018: Matt and Yivan's paper on the role of stereochemistry in the self-assembly of unimolecular block copolymers appears online in JACS. In this paper, Matt and Yivan prepared a series of stereoisomeric block copolymers using our IEG strategy. Remarkably, they discovered that these block copolymers self-assemble to form different morphologies. 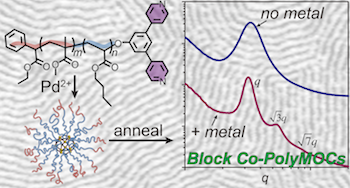 This work elucidates the fundamental role of stereochemistry in block copolymer assembly. Congrats to Matt, Yivan, and the rest of the group for this great work! Click on the image below to read the paper. 17 January 2018: Collaborative paper with the Olsen group (MIT Chemical Engineering) on the topological structure of TetraPEG gels appears online in Macromolecules. In this paper, we developed kinetic graph theory and Monte Carlo simulations that allow for the study of cyclic topologies in A_4 + B_4 polymer networks. These studies confirm that secondary loops, wherein two strands link two adjacent junctions, play a particularly fundamental role in the properties of these ubiquitous materials. Congrats to Tzyy-Shyang and Rui for yet another great work! Click on the image below to read the paper. 18 December 2017: The group welcomes new visiting student Shuto Mochizuki and visiting professor Prof. Masahiro Fujita. 5 December 2017: Collaborative paper with the Olsen group (MIT Chemical Engineering) on quantifying the gel point in end-linked polymer networks appears online in ACS Macro Letters. In this paper, we use Monte Carlo simulations to show that if loop defects defects are properly accounted for, one can predict the gel point without any other fitting parameters. 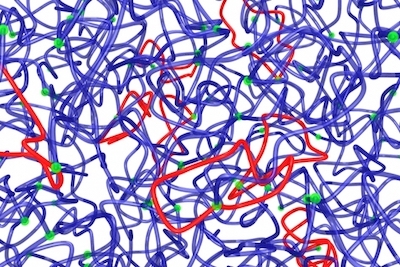 These results further highlight the fundamental role of loops in determining the properties of polymer networks. Congrats to Rui and Tzyy-Shyang for this great work! Click on the image below to read the paper. 4 December 2017: Jeremiah receives the 2016-2017 School of Science Prize in Undergraduate Teaching! It is an incredible honor to be included on this list of amazing teachers... thank you MIT! Click here for MIT News story. 15 November 2017: Jeremiah joins the Koch Institute for Integrative Cancer Research at MIT. 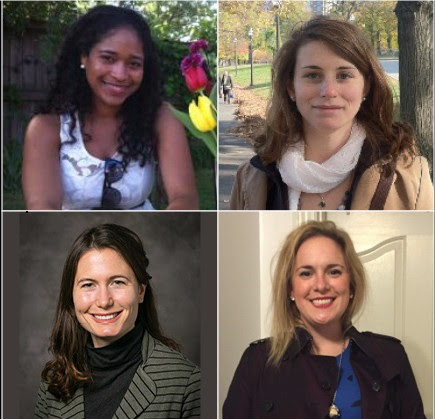 14 November 2017: The group welcomes 3 new graduate students! Sachin Bhagchandani, Matthew Pearson, and Wencong Wang! 8 November 2017: The group welcomes new UROP Alexandra Sourakov! 3 November 2017: Collaborative paper with the Shao-Horn group (MIT Mechanical Engineering) and Samsung Advanced Institute of Technology (SAIT) on understanding electrolyte stability in the Li-air battery cathode published in Journal of Materials Chemistry A. In this paper, we calculate the bond dissociation energies, acidities, driving forces for nucleophilic substitution, and electrochemical stabilities of a wide range of organic molecules under conditions that mimic the Li-air battery cathode. These results allowed us to predict structure-stability relationships and degradation mechanisms that agreed with experimental stability tests. Congrats to the whole team, especially Shuting and Mao, for this great effort! Click on the image below to read the paper. 30 October 2017: Welcome to visting student Gaby Gil Alvaradejo and visting professor Xiaojuan Liao! 14 September 2017: The Tech, MIT's student newspaper, interviews Jeremiah about the new Minor in Polymers and Soft Matter (MPSM). Click here to read the stoy. 14 September 2017: Congratulations to Dr. Michelle MacLeod for successfully defending her thesis. The group's 4th PhD!!! 5 September 2017: Dr. Bo Qiao joins the group as a new joint postdoc with the Shao-Horn Group! 30 August 2017: MIT unveils the new Minor in Polymers and Soft Matter (MPSM)! 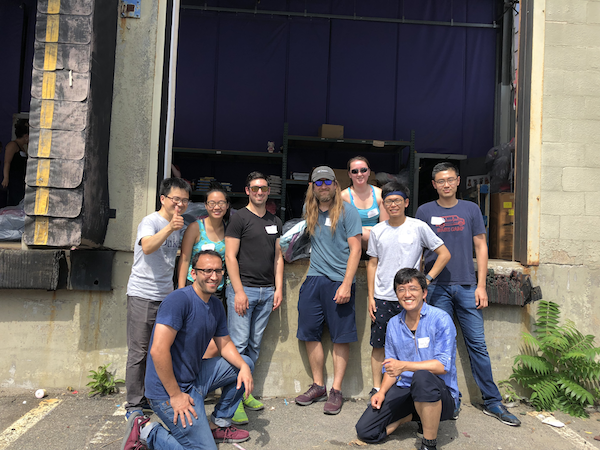 If you're an MIT undergraduate interested in polymer science and/or engineering, and you'd like to pursue the MPSM, contact Jeremiah or click here for details. 22 August 2017: Michelle's block-co-polyMOF paper selected as the Paper of the Month by the Polymer Chemistry Blog. Congrat's Michelle! 21 August 2017: Alex and Jeremiah share the 2018 Nobel Laureate Signature Award for Graduate Education in Chemistry. See List of ACS National Award Winners Here. 21 August 2017: Yoshiki's paper on mikto-brush-arm star polymers ("MBASPs") is published online in ACS Macro Letters. 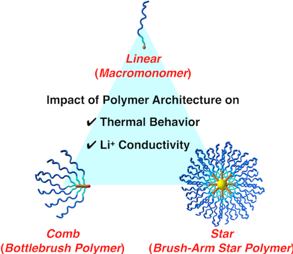 In this paper, Yoshiki demonstrates the synthesis of brush-arm star polymers with arms of varied composition through the convergent cross-linking of independently synthesized living bottlebrush polymers. Congrats Yoshiki! 19 August 2017: New postdoc Dr. Jessica Lamb arrives from Cornell! 10 August 2017: Welcome to new postdoc Dr. Eileen Burke who joins us from UW-Madison! 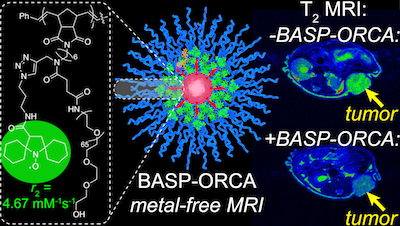 12 July 2017: Hung's paper on BASP-ORCAs, the first metal-free paramagentic agents with sufficient stability and relaxivity for MRI imaging in vivo up to 20 h following injection, is published in ACS Central Science. This work shows that organic radical MRI contrast agents can potentially compete with metal-based agents, the latter of which suffer from serious toxicity concerns. Congrats Hung! Click here to read the MIT News story. 12 July 2017: Michelle's paper introducing "Block Co-PolyMOFs" is published in Polymer Chemistry. Block Co-PolyMOFs are novel polymer-polyMOF hybrid materials derived from block copolymers that feature a polyMOF forming oligomer block and an amorphous polymer block. Michelle demonstrates that these block copolymers can bind to zinc ions and yield easily processable and highly stable crystalline polyMOFs embedded within amorphous polymer networks. Congrats Michelle! 26 June 2017: Nate Oldenhuis receives an NIH F32 Postdoctoral Fellowship. Congrats Nate! 21 June 2017: Welcome to new postdoc Dr. Yoshiki Shibuya! 11 June 2017: Welcome to the rest of our summer visiting students: Julian Grundler, Sarah Al Abdullatif, and Leticia Costa! 8 June 2017: Congratulations to Dr. Ken Kawamoto, the group's third PhD!!! 29 May 2017: Welcome to the first of our summer visitors! Prof. Ellane Park joins us from Rollins College and Manuel Hartweg is a visiting graduate student from Queen Mary University of London. 24 May 2017: Michelle MacLeod was honored at the 2017 celebration of Graduate Women of Excellence. Congrats Michelle! 18 May 2017: Welcome to new postdoc Dr. Nate Oldenhuis! 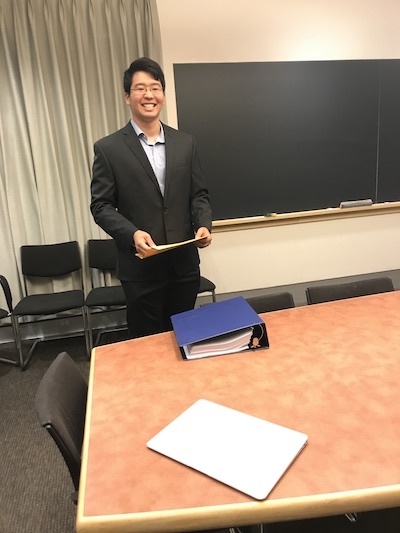 10 May 2017: Congrats to Dr. Ken Kawamoto for successfully defending his thesis! The 3rd group PhD!! 24 April 2017: Yuwei's paper on using semi-batch monomer addition to control loops in polymer networks and thereby enhance or tune their mechanical properties is published online in PNAS. Congrats Yuwei! 19 April 2017: Ken Kawamoto presented his research on branched-bottlebrush polymer assembly in the Excellence in Graduate Polymer Research Symposium at the ACS National Meeting in San Francisco. Congrats Ken! 11 April 2017: Jiwon Park awarded a Fulbright Scholarship! Congrats Jiwon! 10 April 2017: New post-doc Peyton Shieh joins the group! Welcome Peyton! 3 April 2017: We are happy to be part of a multi-PI team sponsored by the Toyota Research Institute that will design novel polymers for energy storage applications. 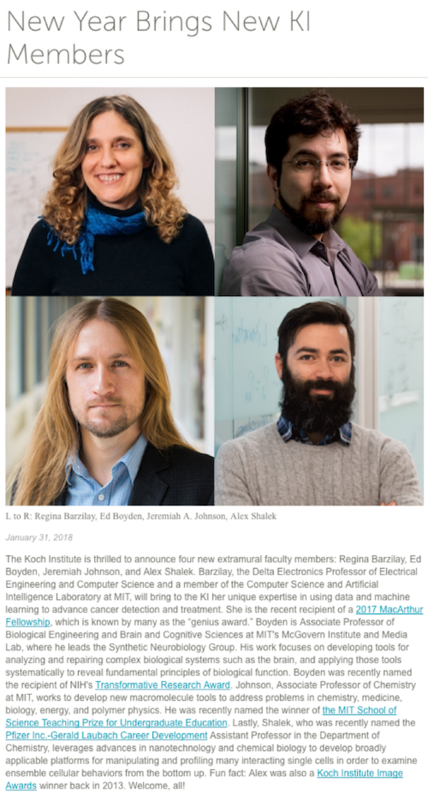 Click here for the MIT News announcement. 7 March 2017: Collaborative paper with the Olsen group on odd-even effects of junction functionality on the primary loop fraction in end-linked polymer networks appears online in Macromolecules. Thanks to Brad and Rui for the great work! 1 March 2016: The group welcomes two new group members: Simi Bright (MIT UROP) and Dr. Junpeng Wang (post-doc)! See group page for more details. 10 February 2017: Jeremiah joins the editorial advisory boards of Macromolecules and ACS Macro Letters. 6 February 2017: Collaborative paper with the Balazs group on photoregeneration of severed gels published online in Soft Matter. Thanks to Anna and her group for the great collaboration! 3 February 2017: Matthew Golder receives an NIH F32 Postdoctoral Fellowship. Congrats Matt! 2 February 2017: Mao's paper on a thermally responsive and recyclable gel photoredox catalyst for multiple-stimuli- and logic-gated controlled radical polymerization appears online in Journal of the American Chemical Society. Congrats Mao! 23 January 2017: Jiwon Park is highlighted by MIT News. Click on the image below to read the story. Congrats Jiwon for your amazing accomplishments! 13 January 2017: Mao and Yuwei's paper on Living Additive Manufacturing via Photo-Redox Catalyzed Growth (PRCG) of polymer networks published online in ACS Central Science. Click on the image below to view the open access paper, and read the MIT News story here. Congrats Mao and Yuwei and the whole team! 5 December 2016: Yufeng's paper on Star PolyMOCs published online in Angewandte Chemie. Click on the image below to view the paper. Congrats Yufeng! 4 December 2016: Jeremiah is promoted to Associate Professor with Tenure! 28 November 2016: The group welcomes first year graduate student Peter Qin! 20 October 2016: Welcome to new postdoc Dr. Nolan Gallagher and UROP Kathleen Chen! 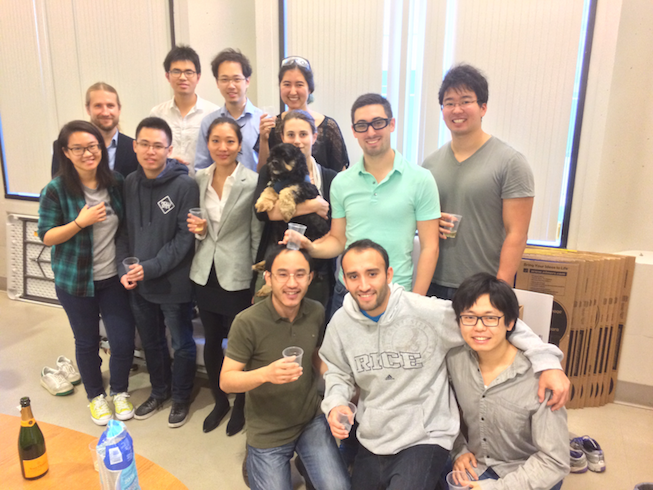 10 October 2016: Congratulations to Dr. Jenny Liu, the group's second PhD!!! 3 October 2016: Former group member Dr. Mao Chen begins his new position as Assistant Professor at Fudan University. Congrats Mao! 15 September 2016: Mingjiang, Rui, and Ken's paper on quantifying how topological defects impact the elasticity of polymer networks published online in Science. Congrats to the team! Click on the image or links below to see the paper, read the MIT News highlight, and watch our video on loops in polymer networks! See MIT News story here. 14 September 2016: Jonathan's paper with Peter Bruno and Mike Hemann (MIT Dept. 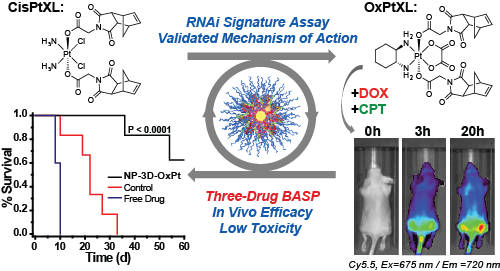 of Biology) on using RNAi signatures to investigate the mechanism of action of 3-drug conjugated BASP nanoparticles built from platinum crosslinkers published online in JACS. Congrats to Jonathan and the whole BASP team! Click on the image below to read the paper. 8 September 2016: Alex and Julia's paper on the role of polymer chain length and branching in the structure and properties of polyMOCs published online in Macromolecules. Congrats! 1 September 2016: Ken and Mingjiang's paper on the self-assembly of "A-branch-B" diblock bottlebrush copolymers published oline in JACS. Congrats Ken and Mingjiang! The Plastics Revolution: How Chemists are Pushing Polymers to New Limits. 16 August 2016: Yufeng's paper on "Block Co-PolyMOCs" published in JACS. Congrats Yufeng! 3 August 2016: Welcome to new postdocs Dr. Wenxu Zhang and Dr. Mingjun Huang, as well as visiting professors Xingui Li and Meirong Huang. 1 August 2016: Former group member Dr. Yufeng Wang begins his new position as Assistant Professor of Chemistry at The University of Hong Kong. Congrats Yufeng! 21 July 2016: Dr. Matt Golder wins an IUPAC-SOLVAY International Award for Young Chemists for his PhD thesis work with Prof. Ramesh Jasti. Congrats Matt on this very prestigious award! 21 July 2016: Yivan's paper on IEG synthesis and bulk self-assembly of uniform diblock copolymers published online in JACS. Congrats Yivan! 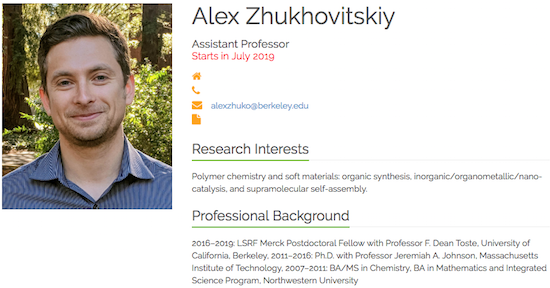 15 July 2016: Former PhD student Dr. Alex Zhukhovitskiy wins a Life Sciences Research Foundation postdoctoral fellowship for his upcoming work with Prof. Dean Toste at UC Berkeley. Congrats Alex on this very prestigious fellowship, and best of luck at Berkeley! 5 July 2016: The group welcomes visiting students Yoshiki Shibuya, Wencong Wang, and Seth Freedman! 1 July 2016: Alex's paper on inserting persistent carbenes into Si-H bonds in molecules, nanoparticles, and planar surfaces appears online in JACS. Congrats Alex! 1 July 2016: Former group member Dr. Mingjiang Zhong begins his new position as Assistant Professor of Chemical Engineering at Yale University. Congrats Mingjiang! 1 July 2016: Former group member Dr. Jonathan C. Barnes begins his new position as Assistant Professor of Chemistry at Washington University in St. Louis. Congrats Jonathan! 14 June 2016: The group welcomes new post-doc Dr. Farrukh Vohidov! See the group page for more info. 10 June 2016: Congratulations to Dr. Alex Zhukhovitskiy, the group's first PhD!!! 10 June 2016: The group welcomes visiting students Yasmeen AlFaraj and Yongsheng Gao! See the group page for more info. 7 May 2016: Paper with Rui Wang, Brad Olsen, and Alfredo Alexander-Katz on "Universal Cyclic Topology in Polymer Networks" appears in Physical Review Letters. Congrats to all and especially Rui! In this work, Rui was able to show that all loop defects in polymer networks are kinetically linked, such that if we can measure one (which we can) we can measure them all. Truly outstanding! 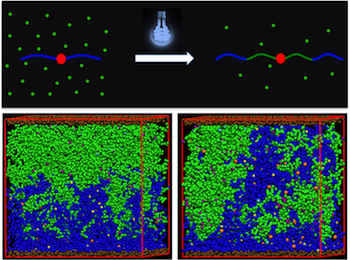 1 April 2016: Collaborative paper with Anna Balazs using simulations to study phase separation in our photo-growth gels published in Polymer Chemistry! 15 March 2016: Mao and Mingjiang's review on light-controlled radical polymerization appears online in Chemical Reviews! 25 February 2016: Jonathan Barnes accepts a position as Assistant Professor in the Department of Chemistry at Washington University in St. Louis! Congrats! See Announcement Here. 19 February 2016: Mao and Mingjiang's Chemical Reviews article on Photo-controlled Living Radical Polymerization is accepted for publication! Details to follow. Congrats! 16 February 2016: The group welcomes new visiting student Alan Enciso and new UROP Cathy Zhang! 14 February 2016: Welcome to two new group members: Shidong (Will) Deng (visting undergraduate student from Tianjin University) and Prof. Jun Lin (visiting professor from Yunnan University). 13 January 2016: IEG+ paper highlighted in Synfacts! 4 January 2016: Jeremiah receives the 2016 Young Talent Award from the organizers of the 1st International Conference of Molecular Engineering of Polymers (MEP-1). This exciting conference will be held in October 2016 in Shanghai. Thank you to the MEP-1 organizers and, in particular, Prof. Jiandong Ding. 24 December 2015: The Johnson Group's work is highlighted in the Boston Globe's STAT News. See the article here: "Three People to Watch in Kendall Square in 2016." 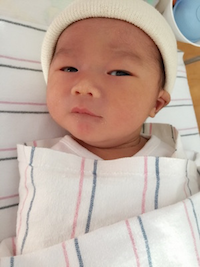 9 December 2015: Yufeng's baby boy Charles Hanyou Wang is born! Congrats Yufeng! 1 December 2015: Ken and Mingjiang's paper on counting primary loops in tetrafunctional and mixed-junction networks prepared using click chemistry appears online in Macromolecules! 16 November 2015: Alex and Mingjiang's paper on high branch functionality and loop rich PolyMOCs appears online in Nature Chemistry! Congrats! 12 November 2015: The group welcomes back Julia Zhao! Once a visiting undergraduate student, now a PhD student. Welcome Julia! 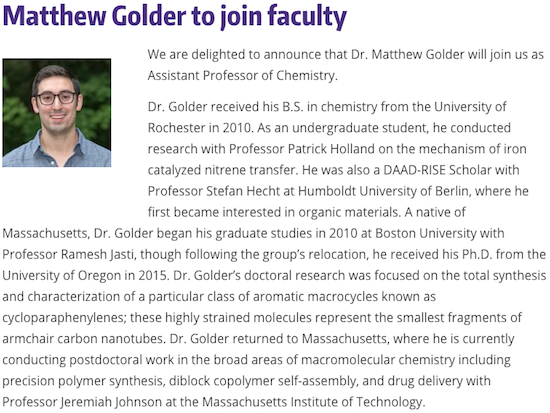 5 October 2015: New post-doc Matt Golder joins the group! See group page for more information. Welcome Matt! 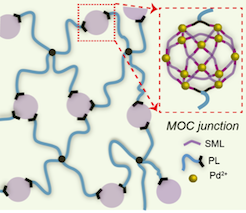 1 October 2015: Alex and Mingjiang's paper on highly branched and loop rich "Polymer Metal-Organic-Cage" (PolyMOC) gels is accepted for publication in Nature Chemistry! Details to follow. Congrats Alex and Mingjiang, and thanks to all of our collaborators on this work! 22 September 2015: Alex and Michelle's review article on carbenes in surface chemistry is published online in Chemical Reviews! A lot of very hard work went into this fantastic paper. Congrats! 14 September 2015: IEG+ paper highlighted by Chemistry World! 10 September 2015: Jeremiah has joined the editorial board of Polymer Chemistry! 7 September 2015: Jonathan's paper on the synthesis of stereo- and sequence-controlled polymers by iterative exponential growth plus side-chain functionalization (IEG+) appears online in Nature Chemistry! Congrats Jonathan! 19 August 2015: Flow-IEG paper highlighted by C&EN@ACS Boston 2015 and C&E News, Science and Technology, News of the Week! 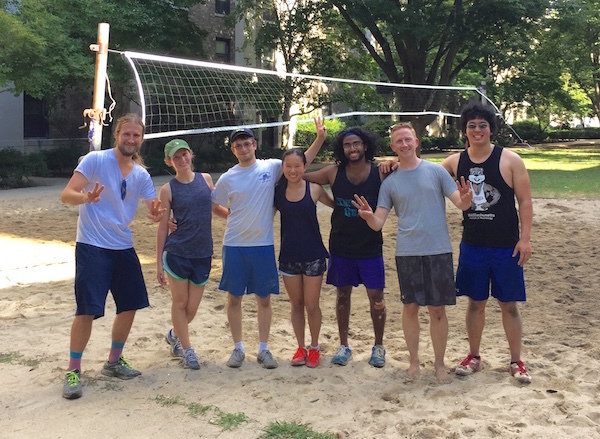 12 August 2015: The joint Johnson/Van Humbeck group volleyball team (Jeremiah was a Van Humbeck Whale) takes 3rd place in the Chemistry Department summer beach volleyball league! 12 August 2015: Frank's paper on continuous-flow iterative exponential growth (flow-IEG) of unimolecular polymers appears in PNAS! Congrats Frank! 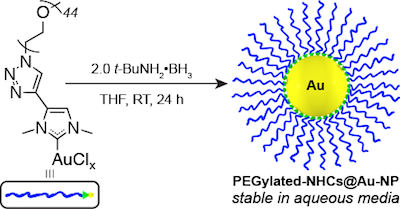 17 June 2015: Michelle's paper on PEGylated-NHC functionalized gold nanoparticles appears in JACS! Congrats Michelle! 30 April 2015: Mao and Michelles's paper on using 10-phenylphenothiazine as an organic photo-redox catalyst to mediate visible-light controlled radical polymerization from a trithiocarbonate appears online in ACS Macro Letters! Congrats! 20 April 2015: Jonathan wins an IUPAC-SOLVAY International Award for Young Chemists for his PhD thesis work with Prof. Fraser Stoddart. Congrats Jonathan on this very prestigious award! 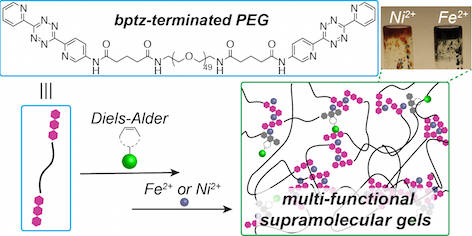 9 April 2015: Ken's paper on combining tetrazine-metal coordination and Diels-Alder reactions for the synthesis of functional supramolecular gels appears online in ACS Macro Letters! Congrats Ken! 2 April 2015: The group welcomes new post-doc Dr. Qixian Chen! 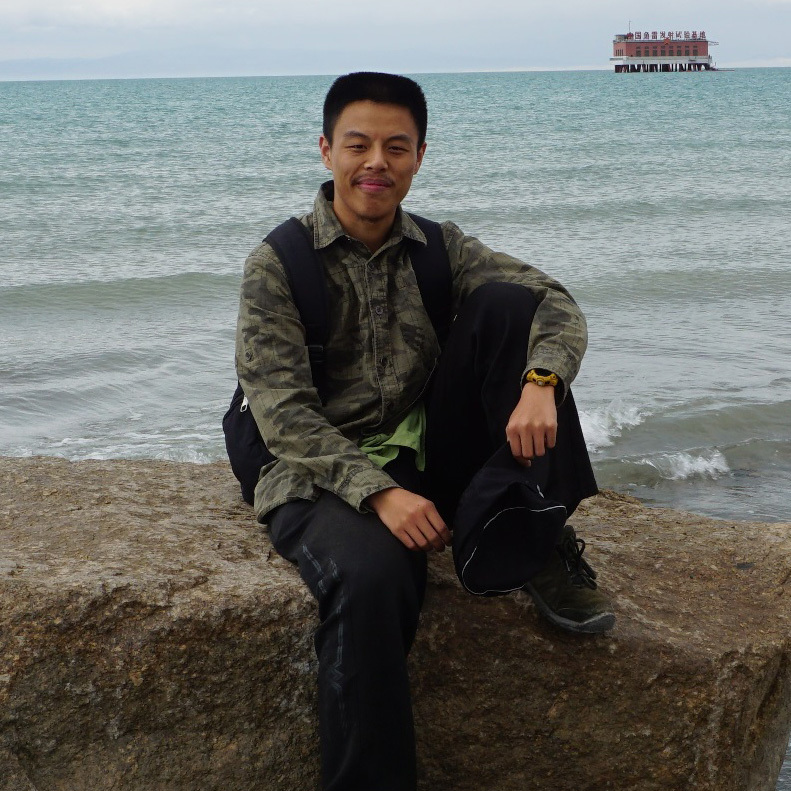 1 April 2015: Congrats to Hung for receiving an NSF Graduate Research Fellowship! 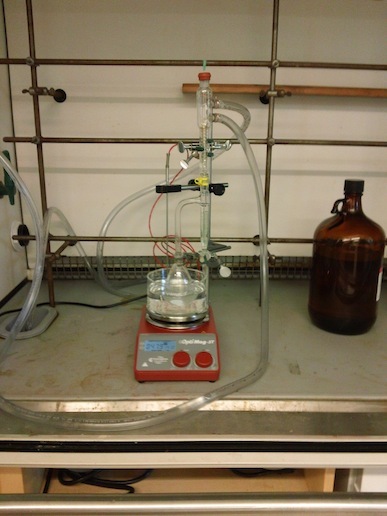 17 March 2015: Mao's paper on improving photo-controlled radical polymerization from trithiocarbonates using continuous flow techniques appears online in Chemical Communications Congrats Mao! 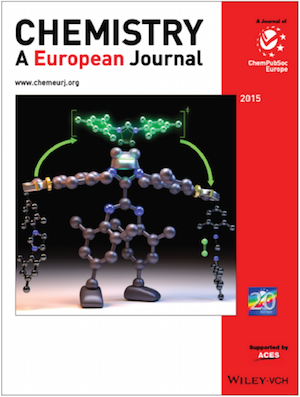 4 March 2015: NHC cycloelimination paper selected for the cover of Chem. Euro. J.! 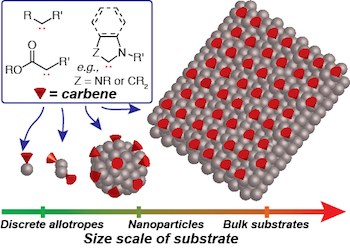 20 February 2015: Alex and Julie's paper on cycloelimination of NHCs appears online in Chem. Euro. J. Congrats! 13 February 2015: Michelle receives a WIC Travel Award for support of her trip to the ACS National Meeting in Denver, CO. Congrats Michelle! 15 January 2015: The group welcomes a new UROP: Katherine Young! 18 November 2014: Molly and Jessica's paper on nitroxide-based branched bottlebrush polymers for dual-modality imaging in vivo appears in Nature Communications. Congrats! Thanks to the Rajca group at University of Nebraska and the Hammond group here at MIT for the fruitful collaboration. 13 November 2014: The group welcomes four new PhD students: Yuwei Gu, Gihan Hewage, Yivan Jiang, and Hung Nguyen! 15 October 2014: The group welcomes two new post-docs: Dr. Mao Chen and Dr. Yufeng Wang! 3 October 2014: The group successfully escapes from a room with a zombie. 1 October 2014: Several new faces in the lab! Welcome Dr. Mao Chen, Julie Geng, and Vivian Tian! 29 August 2014: Alex is recognized with a prestigious American Chemical Society Division of Organic Chemistry Graduate Fellowship. Congrats Alex! 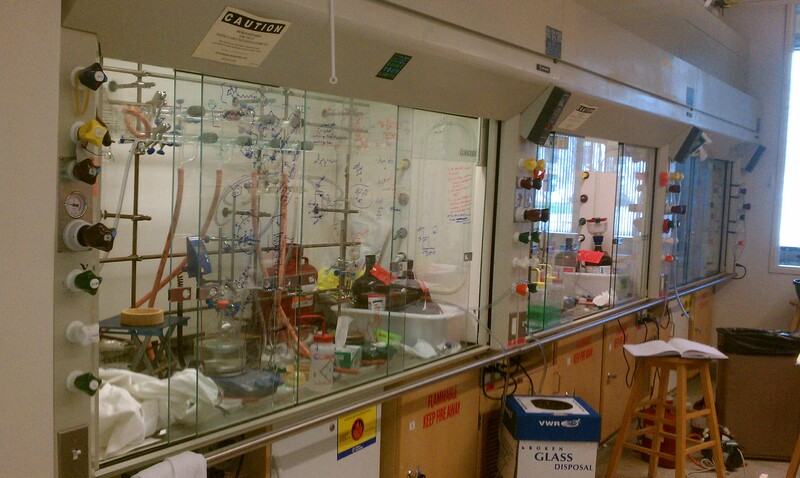 12 August 2014: The lab receives a MIT-DuPont Alliance grant for the synthesis of "perfect polymers". Thank you DuPont! 8 August 2014: Angela and Yan's paper on the synthesis of pH sensitive BASP nanoparticles is accepted for publication in ACS Macro Letters. Congrats! 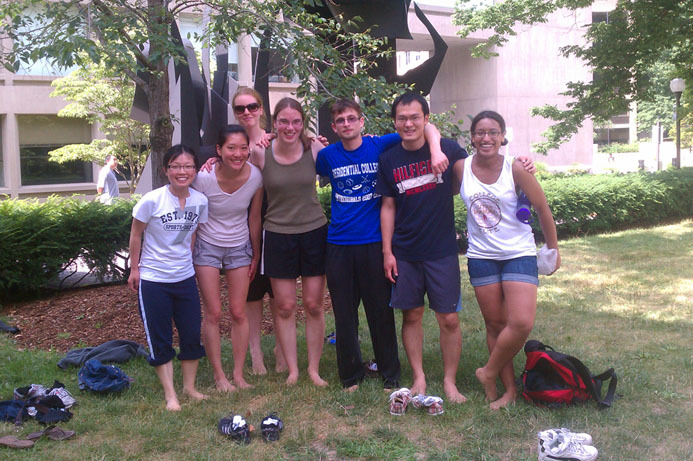 20 June 2014: The group welcomes visiting CMSE intern Julia Zhao! 11 June 2014: The group welcomes visiting MSRP student Leila Terrab! 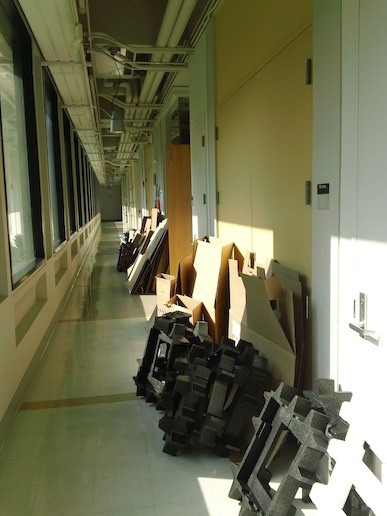 10 June 2014: The lab receives NIH support for the development of organic radical MRI contrast agents. Thank you NIH. 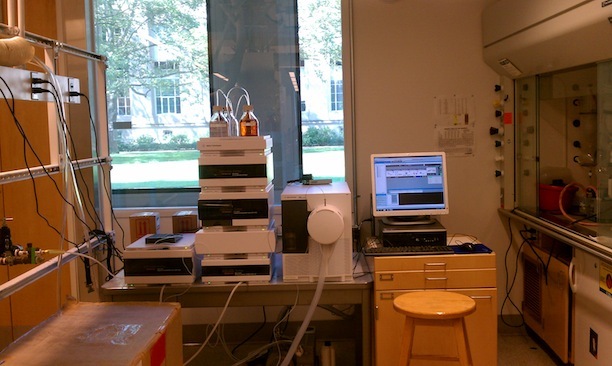 9 June 2014: The lab receives MIT Lincoln Labs ACC support for the development of new materials for photo-controlled 3D printing. Thank you ACC. 29 May 2014: Huaxing, Eva, and Jenny's article on the application of crossover experiments to the analysis of molecular defects in polymer networks appears online in JACS! 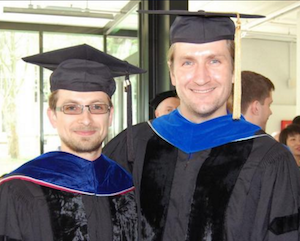 27 May 2014: Alex receives a prestigious 2014 Intel PhD Fellowship! Congrats Alex!! 7 May 2014: Jeremiah receives a 2014 DuPont Young Professor Award! Thank you DuPont! 18 April 2014: Jeremiah receives a 2014 NSF CAREER Award! Thank you NSF! 10 April 2014: Yan and Jenny's work on the synthesis of multi-drug-loaded nanoparticles for ratiometric triplex combination cancer therapy appears in JACS. Congrats Yan and Jenny! 7 April 2014: The group welcomes new visiting student Kojiro Fujimura from Kyoto University! 20 March 2014: Jeremiah receives a 2014 3M Non-Tenured Faculty Award. Thank you 3M! 18 March 2014: The group receives a MIT Energy Initiative (MITEI) Seed Fund Grant for the development of hybrid metal-organic polymeric materials with Prof. Niels Holten-Anderson's group in MIT's Department of Materials Science and Engineering. Thank you MITEI. 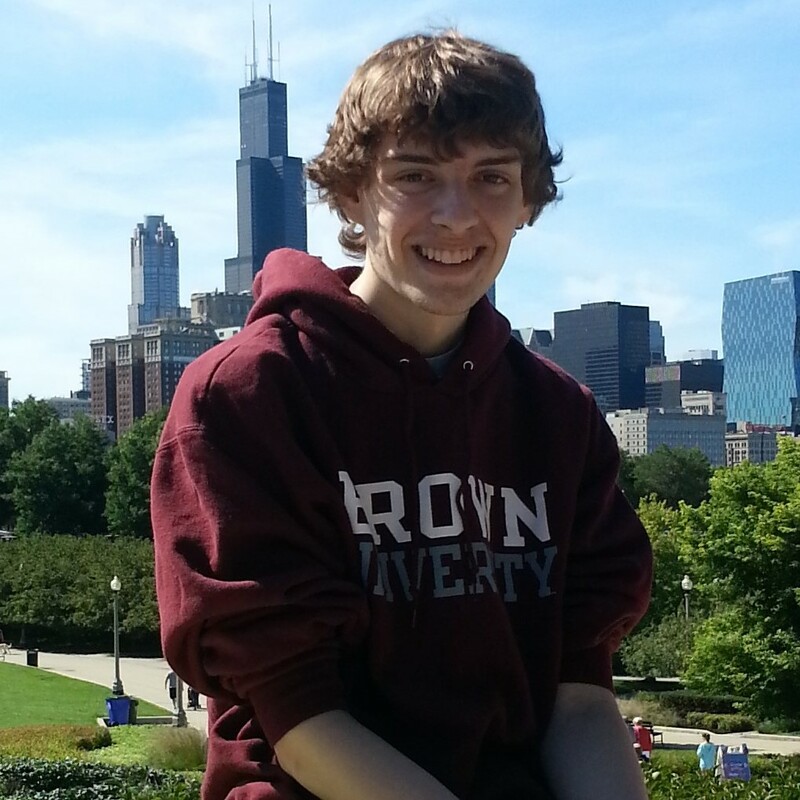 20 February 2014: Jonathan receives 2014 Life Sciences Research Foundation (LSRF) Postdoctoral Fellowship! Congrats Jonathan! 18 February 2014: Jeremiah receives 2014 Sloan Research Fellowship! Also congrats to colleagues Mircea Dinca, Bradley Olsen, and the rest of the MIT Sloan Fellows! New York Times announcement here. 14 February 2014: The group welcomes new post-doctoral scholar Dr. Jonathan Barnes! 6 February 2014: The groups receives an Air Force Young Investigator Research Program (YIP) Grant to work on the synthesis and self-assembly of branched bottlebrush copolymers. Thank you AFOSR! 6 January 2014: The group welcomes visiting student Johanna Ertl! 1 January 2014: The group welcomes two new undergraduate researchers Chew and Katherine! 15 November 2013: The group welcomes new graduate student Deborah Ehrlich. Welcome Deborah! 15 October 2013: The group welcomes new post-doc Dr. Mingjiang Zhong. Welcome Mingjiang! 11 October 2013: Jenny and Angela's JoVE article titled "Particles Without a Box" is published online. Go see Jenny and Angela make a nice series of our PEG-BASPs HERE . 7 October 2013: Alan and Angela's paper that describes the synthesis of PS-PLA Miktoarm BASPs was accepted as part of a special issue of Macromolecular Rapid Communications focused on cutting-edge polymer synthesis. Congrats Alan and Angela! 30 September 2013: Alan and Yan's paper that describes the "Brush-first and Click Method" for photo-triggered drug delivery appears online as part of a special issue of Photochemistry and Photobiology dedicated to the memory of Prof. Nick Turro. 15 September 2013: Jeremiah was selected as an ACS PMSE young investigator. He will present as part of the PMSE Young Investigator Symposium at the Spring 2014 National ACS meeting in Dallas, TX. 14 September 2013: The Johnson group has received a grant from the National Science Foundation (NSF) under the "Designing Materials to Revolutionize and Engineer Our Future" (DMREF) program. Our project will focus on the design, synthesis, and computational analysis of polymer networks for emerging applications. This project will continue our strong/ongoing collaboration with Prof. Bradley Olsen's group in Chemical Engineering at MIT. Thank you NSF! 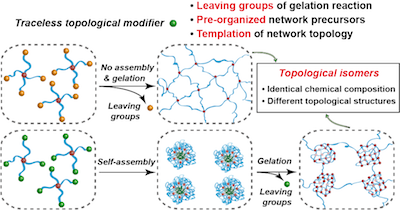 23 August 2013: Alexandra's "tetrazine-norbornene Diels-Alder model networks" paper appears in Macromolcular Symposia as part of a special issue highlighting the 2012 Polymer Networks Group conference in Jackson Hole, WY. Congrats Alexandra! Note that while our article was in press, Professor Kristi Anseth's group published a related paper on tetrazine-norbornene hydrogels for 3D cell culture. See Kristi's excellent paper here: link. 20 August 2013: Congrats to Ken, Molly, and Angela for winning Department of Chemistry Awards for Outstanding Teaching! 17 June 2013: The group welcomes two visiting students: Marco Messina from Mark Olsen's lab at Texas A&M and Tianyuan (Ryan) Liu from Roxbury Community College. It's great to have you both! 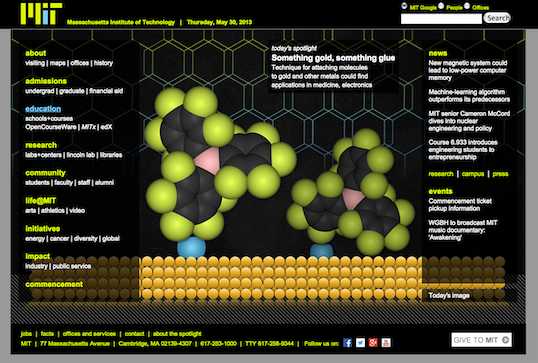 Chemical and Engineering News: "Carbene For Gold Surfaces"
MIT News: "A New Kind of Chemical Glue"
30 May 2013: Carbene surfaces featured as the MIT homepage spotlight! 13 May 2013: Alex's "addressable carbenes for gold surfaces" JACS paper appears online. Congrats Alex! 18 January 2013: Huaxing's "photo-controlled gel growth" Angewandte Chemie paper appears online. Congrats Huaxing! (1) Huaxing's "photo-controlled gel growth" paper chosen as a "Hot Paper" by the editors of Angewandte Chemie: Angewandte "Hot Papers"
27 November 2012: "Brush-first" paper highlighted in SYNFACTS . 15 November 2012: The group welcomes four 1st-year graduate students: Angela, Ken, Michelle, and Molly! 9 November 2012: Counting loops by "S/L Method" paper appears in PNAS (click on the image below to access the paper). Congrats Huaxing, Jen, and Alexandra! "Counting Loops" highlighted in Nature! 4 October 2012: "Pseudo-alternating polymers" paper appears in Macromolecules. Congrats Alan and Alex! 6 September 2012: "Brush-first" paper appears in JACS. Congrats Jenny, Alan and Alex! 1 June 2012: We welcome Eva-Maria Schoen to the group! Eva-Maria is visitng from Professor David Diaz Diaz's group. We are thrilled to have her here for the summer! 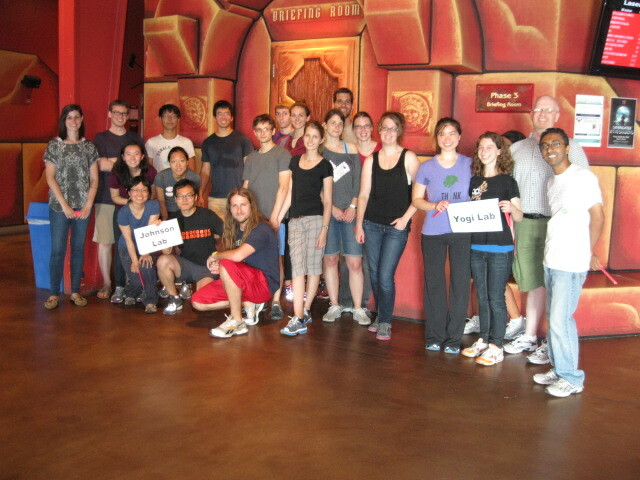 20 May 2012: The Johnson group celebrates their 6-month anniversary with an exciting day of food, drink, and laser tag. 8 May 2012: Johnson group journal blog launched. Click HERE to see what the group is reading. 30 March 2012: Alan O. Burts receives an NSF graduate fellowship. Alex receive's a Morse Travel Grant for the Fall 2012 ACS Meeting in Philadelphia. Congrats Alan and Alex! 17, 24 February 2012: The Johnson group celebrates the first annual Flory Day(s)! Each student gave a presentation on fundamental aspects of synthetic polymer chemistry. Topics included chain and step-growth polymerization, gelation and network formation, controlled polymerization processes, and polymer architectures. Fun was had by all. 11 November 2011: Welcome first year graduate students Alexandra, Jenny, Alan, Alex, and Jessica to the group! Also, welcome Huaxing Zhou (post-doc) and Elisha Yadgaran (UROP)! First group meeting today. 31 October 2011: Paper that describes EPR studies of nitroxide-labeled brush polymers appears in JACS. 8 September 2011: Classes begin! For info on Jeremiah's course, 5.53 Molecular Structure and Reactivity, go here . 15 August 2011: We welcome Jen Woo to the group! 11 July 2011: The Johnson Group begins! We welcome first year MIT graduate students Melissa Donaldson and Alan Burts! 9 June 2011: Thanks to Tim Swager for inviting Jeremiah to the NSF-sponsored "Future Faculty Workshop: Diverse Leaders of Tomorrow," which was held June 19-21 at the MIT Endicott House. For more information on this year's workshop click here . 1 July 2011: The Johnson group begins! The solutions to many of mankind’s greatest problems: prevention and treatment of disease, development of alternative energy sources, preservation of natural resources, etc., will rely on the interdisciplinary application of synthetic chemistry. The Johnson laboratory seeks creative, macromolecular solutions to problems at the interface of chemistry, medicine, biology, and materials science. Materials synthesis is approached in an analogous manner to natural-products synthesis; an interesting target structure is chosen and a synthetic scheme is designed to access that structure as efficiently as possible. The targets are designed de novo from careful consideration of the specific needs of a given application and with a particular emphasis on creative architectural design and function. The tools of traditional organic and organometallic synthesis, synthetic polymer chemistry, photochemistry, surface science, and biopolymer engineering are combined to realize the designs. Just as natural-products chemists must often invent new reaction methodologies to access complex structures and their corresponding derivatives, the Johnson lab will seek to develop new methodologies for the construction and modification of complex material libraries. Iterative library synthesis, function-based screening, and design optimization will ultimately yield basic knowledge, such as structure-function relationships for materials in specific applications, and new materials-based technologies that outperform current alternatives. Some examples of target material platforms and their associated applications are: (1) novel, nanoscopic branched-arm star polymer architectures for in vivo drug/gene delivery and supported catalysis, (2) hybrid synthetic-natural hydrogels for correlation of the effects of network microstructure on cell response, and (3) new types of semiconducting organometallic polymers and polymer films for sensing, supported catalysis, and energy conversion. Taken as a whole, our research focuses on molecular design in three primary areas: nano-scale materials synthesis, macro-scale materials synthesis, and development of new chemical methods for modifying interfaces between bulk and nanoscale objects (surface chemistry). Sachin was raised in Bombay, India and obtained his undergraduate education at the Indian Institute of Technology, Roorkee. He spent his summers working on a myriad of polymer-based projects at the Tata Institute of Fundamental Research, Mitsui Chemicals Inc, and the Spanish National Research Council. He is currently co-advised with the Langer Lab where he previously worked as a research assistant towards designing drug delivery hydrogels as part of his master's thesis research. In his free time, he enjoys playing the guitar, soccer and traveling. Eileen grew up in central Wisconsin, then went west to Bozeman, MT in pursuit of skiing and chemistry. She graduated from Montana State University in 2012 after an REU at UMN-Twin Cities with Prof. William Tolman studying catalyst design for PLA synthesis. From there she returned to Wisconsin to study at UW-Madison under Prof. Jennifer Schomaker. There she worked to develop allene functionalization methodologies to approach both densely functionalized motifs and strained heterocycles for use in SPAAC applications. Eileen joined the Johnson group in August 2017 to study flow oxidations and polymerizations. I am from Lagos, Nigeria. I am currently a sophomore majoring in chemical engineering and chemistry. I have previously worked in the Kulik Lab on optimizing nanoparticle structures and last summer I did research on stem cells for tissue engineering. 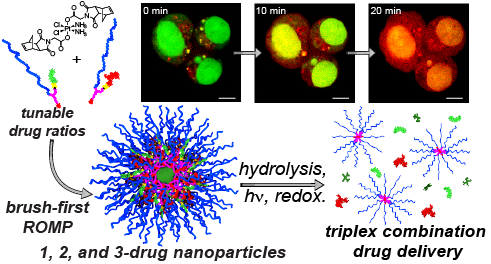 I am excited to work on nanoparticles for drug delivery in the Johnson lab. In my free time I enjoy playing soccer, watching Netflix and mixing music as an amateur dj. I’m an international student from Rio de Janeiro, Brazil. I’m a rising junior majoring in Chemistry at Wesleyan University, where I work on computational modeling and molecule system comprehension research. 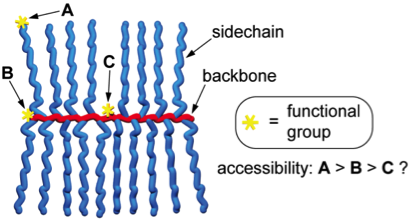 The aim of my project is to gain an understanding of the transduction of ligand binding energy into allosteric signal transmission for proteins. I'm back in the Johnson Group for another summer as part of the MIT Summer Research Program working with Peyton Shieh. I aspire to obtain a PhD and return to Brazil in order to increase the scientific development of my country. Aside from academics, I enjoy traveling, watching tv series, reading novels in Portuguese, and spending time with my friends. I am a local girl who grew up ~20 miles away in Natick, MA. I received a B.S. in chemistry from the University of Massachusetts, Amherst. During my undergraduate education, I worked in the Coughlin group synthesizing photo-cleavable polymers and with Prof. Ramanathan Nagarajan modeling peptide adsorption to lipid bilayers. I am very excited to continue studying polymer chemistry in the Johnson group! In my free time, I enjoy making a mess in the kitchen, playing the oboe, and reading. Matt was raised in America’s largest town, Framingham, MA, before heading to the University of Rochester to earn his BS in Chemistry. 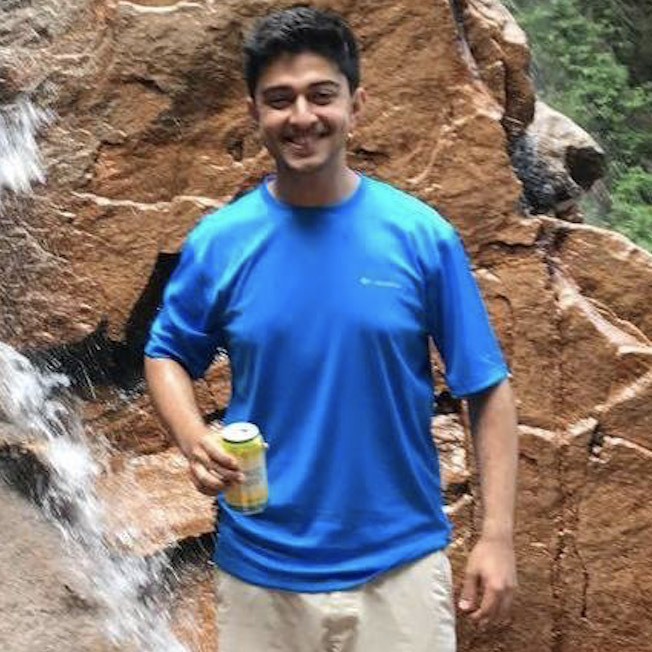 While in upstate New York, he conducted research in Prof. Patrick Holland’s lab, was a member of the swim team, and became proficient in hiking across a snowy campus. He was also a DAAD-RISE Scholar with Prof. Stefan Hecht in Berlin, Germany where he first became interested in organic materials. Matt moved back to Massachusetts in 2010 to begin graduate school at Boston University with Prof. Ramesh Jasti. Later, he moved with the group to the University of Oregon where he obtained his PhD in 2015. During his doctoral studies, Matt’s research was focused on the total synthesis and characterization of strained aromatic macrocycles (carbon nanotube fragments). He joined Prof. Jeremiah Johnson’s group in October 2015 to apply his passion for making molecules and materials towards broad problems in polymer chemistry. In his free time, Matt enjoys shooting photos, cooking, exploring the gym, and travelling. I was born and raised in the Rio Grande Valley, which is a region in the southernmost part of Texas. I currently attend Texas A+M where I will be earning a B.S. in chemistry and a minor in physics and mathematics. I began doing research my freshman year of college under Dr. Meigan Aronson where I mainly synthesized nanocrystals, such as HfNiSn. Working in a laboratory sparked my interest in research so I decided to work under Dr. Sarbajit Banerjee after a semester in Dr. Aronson’s lab. In Dr. Banerjee’s lab I have worked on the synthesis of Mg nanowires via electrocrystallization, as well as the synthesis of hafnia by following a procedure similar to the Stöber process; both of these projects interested me because they have the potential to advance current technology. After taking Organic Chemistry I with Dr. David Bergbreiter I developed an interest in organic chemistry and found myself at the Johnson Group. In my free time I enjoy reading, watching documentaries, and playing board games. I was raised in Ningbo, a beautiful coastal city in China. I received my B.S. in Chemical Biology from Tsinghua University (Beijing, China). In my undergraduate education, I worked in Prof. Huaping Xu’s lab synthesizing tellurium-containing polymers as drug-delivery vehicles (Believe it or not, they are actually quite bio-compatible!). In 2013, I took a summer research position in Prof. Steve Granick’s lab at University of Illinois at Urbana–Champaign, where I was trained as a polymer physicist and finally fell in love with polymer physics. 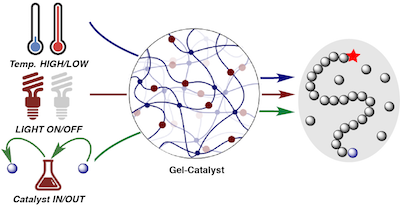 In the Johnson group, I’m excited to explore uncharted territory at the interface between hydrogel chemistry, gelation physics, and even cell migration. Let’s wish me good luck. Manuel was born and raised in Germany. He obtained his B.Sc. in chemistry from the Karlsruhe Institute of Technology, Germany, in 2012, where he worked with Prof. Michael Meier. Afterwards, he completed his M.Sc. at the University of Marburg, Germany, working with Prof. Joerg Sundermeyer. During his masters, Manuel spent 4 months at Florida State University, USA, in the group of Prof. Tyler McQuade. In 2015, he started his PhD. at Queen Mary, University of London, UK, working with Dr. Remzi Becer on an industrial project. His research included not only the synthesis of polymeric materials based on a sustainable feedstock, but also the design of polymers for biological applications. Afterwards, Manuel joined the Johnson lab in Fall 2018, where he plans to continue working on synthesis of polymers for different applications. In his free time, Manuel enjoys all kind of sports, the outdoors and travelling. I grew up in the town of Stow, MA famous for its apple farms. 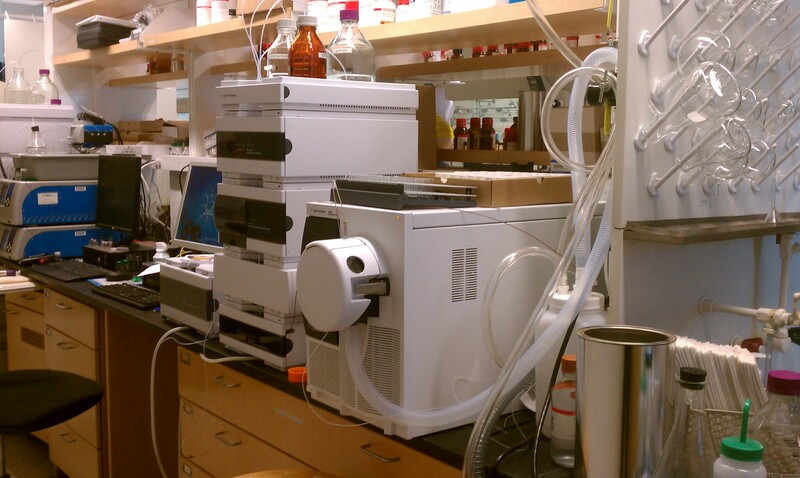 I got my BA in Biochemistry from Columbia University where I learned a great deal in the lab of Luis Campos. There, I developed an avid interest in polymer chemistry and its various applications in photovoltaics, energy storage, and gene transfection. Now, I'm excited to be a graduate student back in my home state of Massachusetts. In the Johnson group, I aim to further my understanding of macromolecular research through studying polymerization techniques and systems for drug delivery. I was raised in Oakville, Ontario and moved to the United States for graduate studies. I completed my Honours B.Sc. in Materials Chemistry at McGill University. I worked in the lab of Dr. Mark Andrews where I synthesized and characterized various morphologies of magnetite and lanthanide-doped magnetite nanoparticles, and monitored their impact on Rosenzweig instabilities of their respective high-concentration colloidal dispersions. 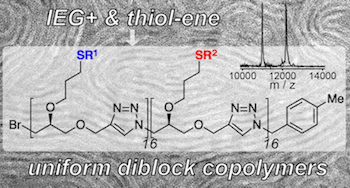 I then worked under the co-supervision of Dr. Hanadi Sleiman and Dr. Dmitrii Perepichka on the synthesis and characterization alternating copolymers (oligomers) of diketopyrrolopyrroles. I am excited to continue my studies of polymer chemistry and extend my work to principles underlying control of network topology in the Johnson group at MIT. Sam was raised in the countryside of Butler, PA and received her BS in chemistry from Penn State Behrend in 2011. During her undergraduate career, she conducted research synthesizing hypervalent iodine compounds under the direction of Dr. Michael Justik. Tired of the snowy weather, she moved to sunny Texas A&M University where she worked under the direction of Professor Karen Wooley on synthesis and characterization of phenolic linear and cross-linked polymers for various applications. 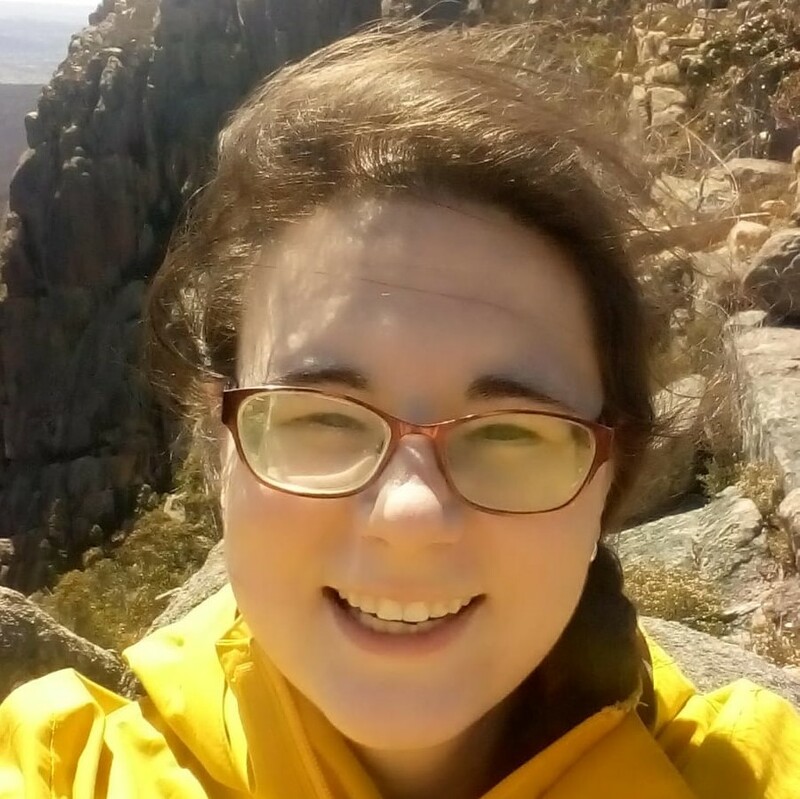 Looking for adventure and another area of research, she moved to Australia for 1.5 years and worked as a postdoc in material science in the laboratory of Professor Frank Caruso at the University of Melbourne. In September 2018, she joined Professor Jeremiah Johnson’s group to work in the area of polymer synthesis towards biomedical applications. In her free time, Sam enjoys hiking, outdoor adventures, watching college football, and cooking. Jessica grew up in Fargo, North Dakota and received her BS in Chemistry from the University of North Dakota in 2012. During her undergraduate career she worked on the solvent-free synthesis of organometallic compounds (cyclopalladated complexes) under Prof. Irina Smoliakova and conducted summer research in the Coatings and Polymeric Materials Department of North Dakota State University under Prof. Victoria Johnston-Gelling. She then moved to Cornell University for her graduate studies under Prof. Geoffrey Coates. There she worked on catalyst development, methodology, and mechanistic investigations of selective epoxide transformations using bimetallic catalysts, culminating in her PhD in 2017. She joined Prof. Jeremiah Johnson's group in August 2017 where she will study photo-mediated polymerizations and complex polymer architectures. Outside of lab she enjoys swing and ballroom dancing, crafts, reading, and photography. Originally from Vietnam, I came to the States in 2009 for my undergraduate study. I attended Northern Virginia Community College, and then transferred to the University of North Carolina at Chapel Hill to finish my B.S. in Chemistry. During my undergraduate study, I worked on developing a radiopaque iodine-containing bone cement in Dr. Valerie Ashby’s lab (UNC-CH) and multi-stimuli responsive nanocapsule systems under Prof. Katharina Landfester (MPI-P), both of which clearly shaped my interest in polymer design and its vast potential in the biomedical field. 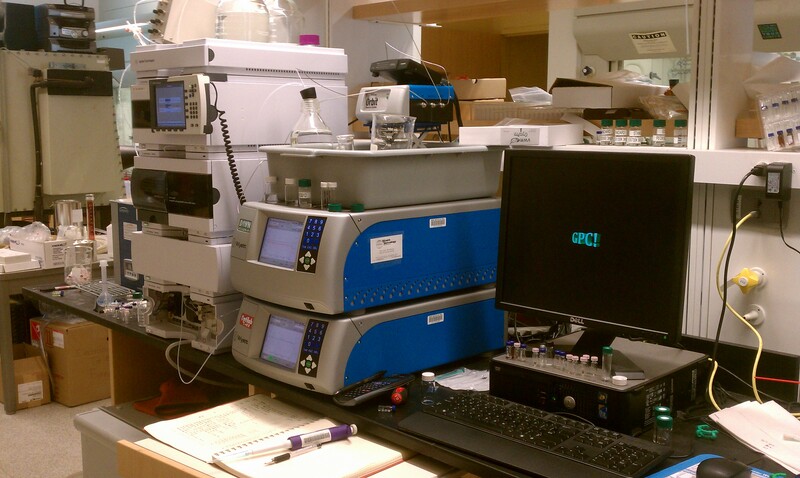 Upon graduation, I worked on impurity characterization and API release profiling in oncology drugs at GSK. Joining the Johnson group, I will be working on developing ROMP-based BASP nanoparticles for applications in biomedicine, including imaging and drug delivery. Nate was raised in the cultural hub that is Omaha, Nebraska. He obtained his bachelors degree in chemistry from the University of Iowa in 2012. During his undergraduate career, Nate worked with Prof. Hien Nguyen at Iowa, and spent his summers working with Prof. Steve Buchwald at M.I.T. During the completion of his Ph.D. at the University of California, Irvine, Nate worked as joint student with Prof. Zhibin Guan and Prof. Vy Dong. During his time there, he worked on creating organic materials using organometallic catalysis, drug delivery polymers, and making mechanical gradients. While in the Johnson lab, Nate plans to continue learning about polymers. In his free time Nate enjoys the outdoors, cooking, climbing, swimming in mostly blue water, and the color green. I was born and raised in Louisville, Kentucky. I received my BS in Chemistry from Brown University, where I worked with Professor Eunsuk Kim, synthesizing biomimetic metal complexes for oxygen atom transfer chemistry, such as CO­2 reduction. I also spent a summer at Brookhaven National Laboratory researching the suprisingly complex energetics of electron-hole separation in polymer-based organic photovoltaic cells. As a member of the Johnson group, I’m excited to apply my interests in inorganic and materials chemistry to bridging the gap between MOF chemistry and polymer chemistry by working toward developing a hybrid material that contains both MOF and polymer domains. Outside of the lab, I enjoy playing ragtime piano, backpacking, engaging in politics, and writing fiction. I was born in China and received my BS in Chemical Biology from Tsinghua University in Beijing. As an undergrad I joined Prof. Xi Zhang's lab to work on superamolecular polymers based on cucurbiturils, spent a summer in Prof. Jeffrey Moore's lab in UIUC synthesizing pheyleneacetylene macrocycles, and built model airplanes that flew (and crashed). I am excited to join the Johnson group to work on IEG polymers. 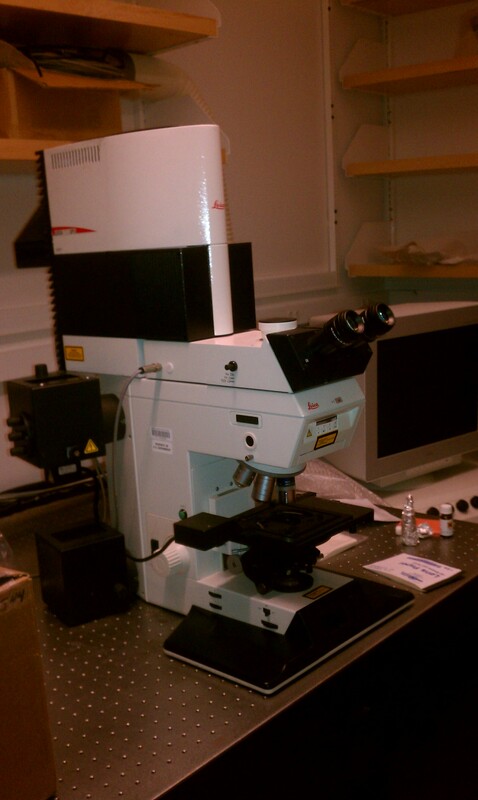 Outside of lab, I like travelling, taking photos, and fixing all kinds of stuff. Bo Qiao was born and raised in the city of Beijing, where he went to high school and college. After obtained his bachelor degree in Chemistry at Peking University (Beijing University) working with Prof. Dahui Zhao on the synthesis of phenylene ethynylene oligomers, Bo decided to move to a less crowded place. In 2012, he attended graduate school at Indiana University and joined Prof. Amar Flood’s research group. In Bloomington Indiana, a lovely college town in the Midwest, Bo spent 5 years studying anion supramolecular chemistry and obtained his PhD degree. In 2017, Bo joined MIT as a post-doctoral scientist co-advised by Prof. Yang Shao-Horn and Prof. Jeremiah Johnson studying Li conducting polymers. Peyton grew up in Michigan, where he developed a love for autumn leaves and warm apple cider. He then studied chemistry at Harvard University, where he worked on the total synthesis of phorbol under the guidance of Professor David Evans. 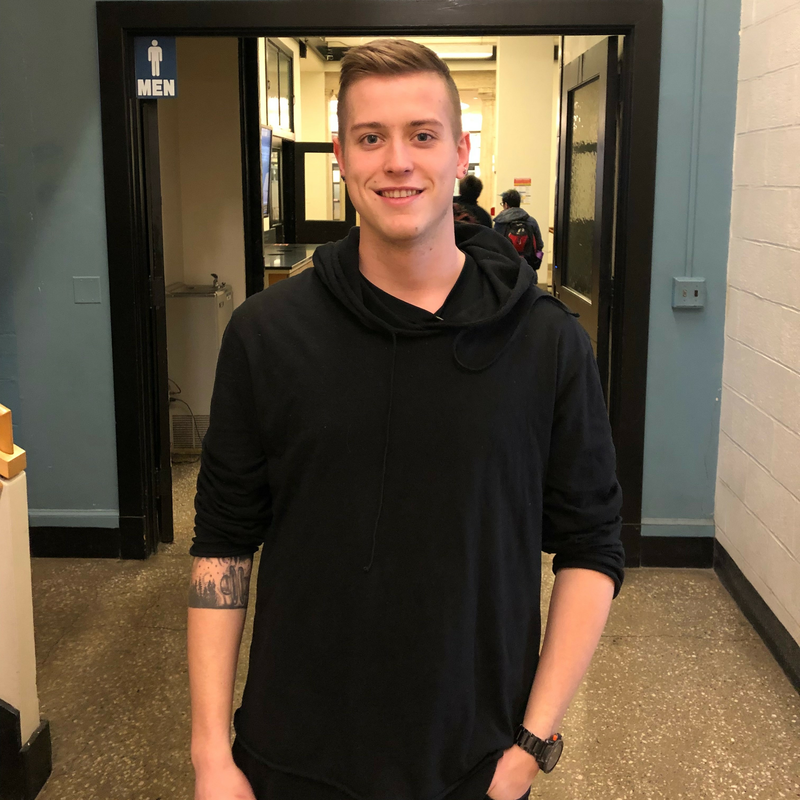 For his Ph.D., Peyton worked with Professor Carolyn Bertozzi at UC Berkeley on the development of responsive small-molecule fluorescent probes for applications in chemical biology and point-of-care diagnostics. After graduating, Peyton spent a bit over a year at Illumina in San Diego working on the surface chemistry of next-generation flowcells for high-throughput sequencing. Peyton is excited to return to Boston and to dive right in to studying the precision synthesis of responsive materials and their applications in biotechnology and medicine. In his free time, Peyton enjoys trying out new recipes, strumming on his guitar, and travelling. In particular, he is excited to explore Boston and the rest of New England, something that he neglected to do during his undergraduate years. I was born and raised in Hyogo-prefecture, which is next to Osaka. I received my BS in chemistry from Doshisha University, and MS and PhD in Organometallic chemistry and Synthetic Organic Chemistry from Kyoto University. Then, I joined Otsuaka Pharmaceutical. I have been working as a medicinal chemist there for about 8 years. I have synthesized many bioactive small compounds. I’m excited to start studying flow chemistry, polymers and nanomaterials. In my spare time, I love going shopping and traveling with my family, my wife and my daughter. I also like playing tennis and soccer, watching sports games, reading books and talking with my friends. Teruhiko received B.S. from the School of Engineering Science in Osaka University in 2009. 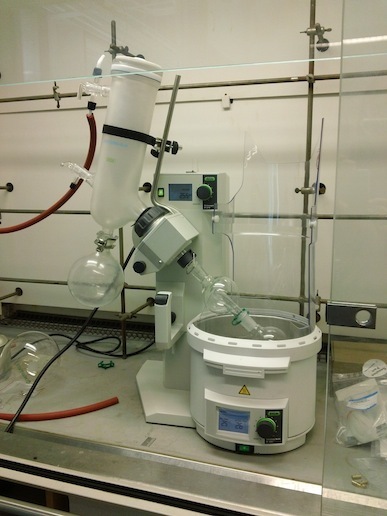 After graduation, he joined the laboratory of Professor Kazushi Mashima where they developed new organometallic catalysts for organic transformations. Fortunately, he had chances to research as a visiting researcher under Prof. Jun Okuda of Aachen University, Germany and Prof. John Arnold of University of California, Berkeley. Upon completion of his Ph.D. in 2014, he joined Prof. Yoshiaki Nakao's group in the Graduate School of Engineering, Kyoto University as a doctoral researcher. In 2016, he assumed a position as an assistant professor of Osaka University, and he moved to his current position at Panasonic in fall. He started a collaborative research project with Prof. Jeremiah Johnson to develop gel-based catalysts for resource synthesis in 2018. In his free time, he enjoys shopping and travelling with his wife. Yoshiki was born and mainly raised in Tokyo, Japan, where the Olympic Games will be held in 2020. He graduated from the University of Tokyo with B.S., M.S., and Ph.D. degrees under the guidance of Prof. Takuzo Aida. In his graduate studies, he focused on crystalline and liquid crystalline tweezers-like molecules that can respond to environmental stimuli. In 2016 when he was a Ph.D. candidate, he joined the Johnson Group as a visiting student and took part in the BASP project. 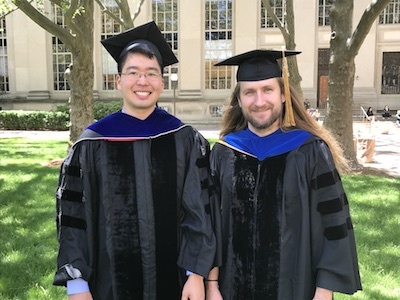 After receiving his Ph.D. in 2017, he joined the Johnson Group again as a post-doc, and is currently participating in the Toyota Research Institute project focusing on polymer electrolytes towards Li-ion batteries. Born and raised in Cleveland, Ohio, Rebecca is currently a sophomore pursuing a Bachelors in a joint degree in chemistry and biology with a minor in polymers and soft matter. Last year, she UROPed in the Myerson Laboratory working on the Pharmacy on Demand project, testing the 3rd segment of the small-scale pharmaceutical manufacturing unit. She is very excited to be working in the Johnson Lab on projects at the intersection of her love for chemistry and biology. In her free time, Rebecca enjoys hiking, kickboxing, reading, and being a part of MIT CRU. I grew up in the swamps of Florida, from whence I emerged to do my B.S. 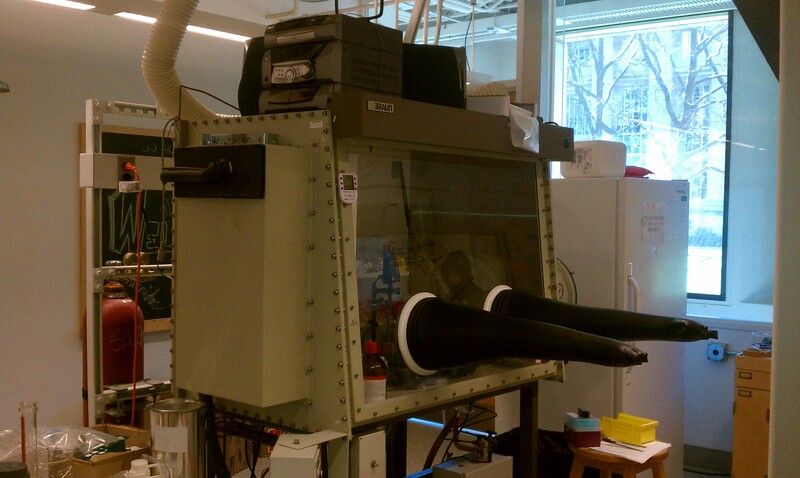 in Materials Science and Engineering at MIT. As an undergraduate, I worked in Professor Polina Anikeeva's lab optimizing the performance of magnetic iron oxide nanoparticles for neural stimulation. Through a summer internship at Formlabs (photopolymer 3D printing), I became interested in polymers. In order to learn more about polymer synthesis, I joined the Johnson Group as a UROP in my senior year. I look forward to delving into polymer chemistry and materials properties of polymer networks. Outside of lab, I like looking for arthropods, playing tennis, inspecting things under a microscope, and getting lost in libraries. I grew up in Marin County, CA, just north of San Francisco. 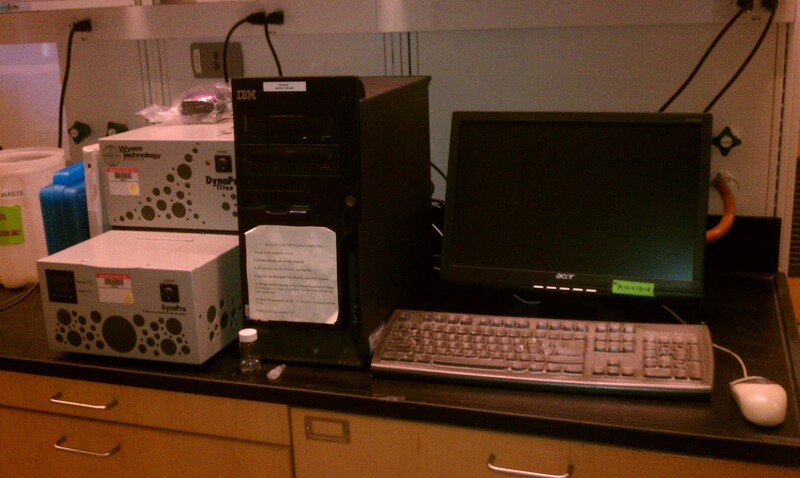 After becoming interested in science at an early age I attended UC Berkeley for undergrad. At Berkeley I majored in physics and minored in chemistry. I also conducted research under Ron Zuckermann at Lawrence Berkeley National Laboratory. There I studied crystal structures and phase transitions of peptoids, synthetic peptoid mimics. After spending most of my life in the Bay Area I decided to move elsewhere for graduate school, and am delighted to be at MIT. In the Johnson Group I study materials for polymeric batteries among other things. 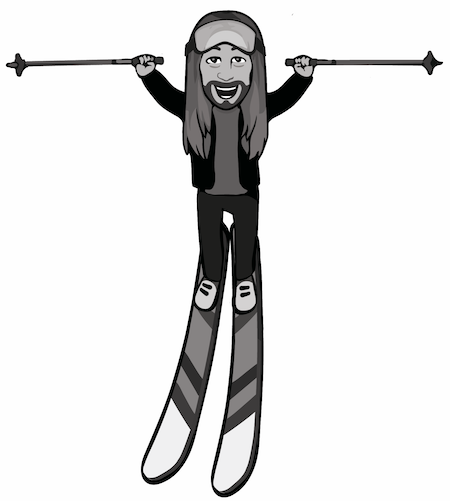 In my free time I am an avid skier, love cooking and watching Jeopardy! I was raised in Dushanbe, the capital of mountainous Tajikistan. After getting involved in my high school chemistry club I became fascinated with chemistry and I was lucky to represent my country in a number of international chemistry Olympiads. I earned my BS in Chemistry from Fatih University in Istanbul, where I worked with Prof. Naz Agh-Atabay on synthesis of macrocyclic complexes of transition metals for antimicrobial applications. In fall of 2010 I began graduate school at Rice University, in Houston, Texas. Under the guidance of Prof. Zachary Ball I developed methods for catalytic protein modification, synthesized a class of luminogenic azide probes, and designed inhibitors of protein-protein interactions. 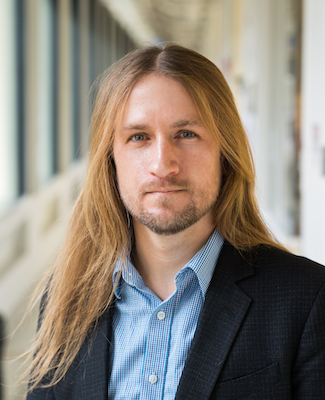 I joined Prof. Jeremiah Johnson’s group in June 2016, where I am excited to have the opportunity to research novel polymer-based biomaterials and their application for drug delivery, biological imaging, and tissue engineering. Outside the lab I lead an active lifestyle, and I especially enjoy running and playing football. In my free time I like to work on my car and explore new places with my fiancée. Junpeng was born in a small town near Xi'an, China, where the Terracotta Army is located. He received his BS in Chemistry from USTC in 2010 and came to the US for graduate studies. He worked on polymer mechanochemistry under the guidance of Steve Craig at Duke University, and received his PhD in Chemistry in 2015. After a year of postdoctoral research at University of Chicago, he joined the Johnson group as a postdoctoral scientist. While Junpeng misses the Chicago Loop, he is more excited and thankful about the opportunity of tackling problems associated with molecular loops in polymer networks. I will start as an Assitant Professor at the University of Akron in January 2019; click here to check out the Wang Lab website! I was raised in Weifang and received my B.S. from Tsinghua University in Beijing, China. I worked in Prof. Huaping Xu’s lab using radical polymerization to synthesize selenium-containing polymers as an undergraduate. In the summer of 2016, I did a summer research on synthesizing IEG polymers in Prof. Johnson’s lab. I’m excited to be back and explore more about IEG polymer and its application in biological systems. I spend my free time reading, listening to music and traveling. I was born and raised in Hengyang, a small city in South China. In 2010, I traveled 20 hours by train to attend Zhejiang University, where I botained my bachelor's degree. After that, I moved to University of Massachusetts, Amherst to pursue my Ph.D. in the Department of Polymer Science and Engineering. 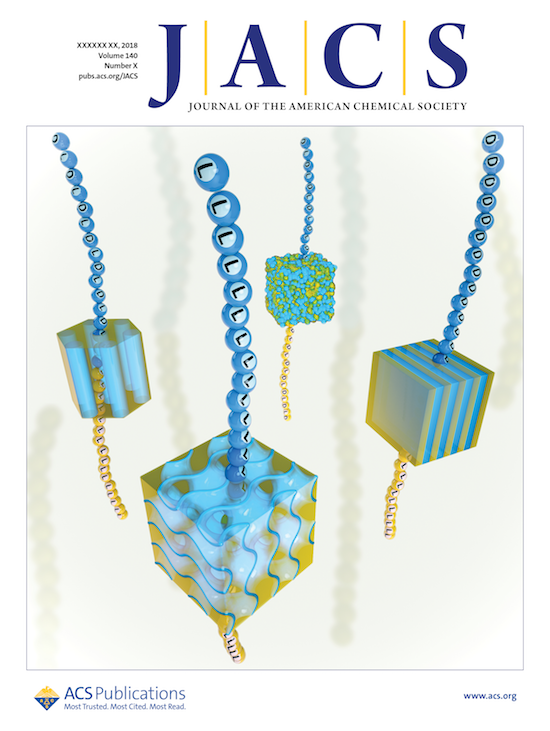 Under the advisory of Prof. E. Bryan Coughlin, I synthesized ionic copolymers for anion transport materials using RAFT and ROMP, and also studied the self-assembly of high-chi block copolymers. Now I am super excited to have the oppurtunity to be a postdoctoral researcher in the Johnson group, working on novel polymers with high stability for energy applications. In my free time, I enjoy eating spicy food, watching soccer, and visiting museums as well as zoos. In addition, I like Bruce Wayne, Tony Stark, and Han Solo. Originally from Kansas City, Missouri, Julia earned a B.S. in chemistry and minored in biochemistry and cell biology at Rice University. As an undergraduate, she explored several areas of materials research, including single molecule spectroscopy and viral engineering at Rice as well as polymeric gene delivery as an Amgen scholar at UW. Julia also spent a summer as a visiting MPC CMSE intern at MIT, where she studied molecular defects in polymer networks in the Johnson and Olsen groups. She enjoyed the experience so much that she returned to MIT and the Johnson group to specialize in polymer chemistry as a graduate student. Julia spends her free time drawing, making music, and watching movies. Gu. Y.†; Zhao, J.†; Johnson, J. A. * Trends Chem. 2019, doi:10.1016/j.trechm.2019.02.017. Gil Alvaradejo, G.†; Nguyen, H. V.-T.†; Harvey, P.; Gallagher, N. M.; Le, D.; Ottaviani, M. F.; Jasanoff, A.; Delaittre, G.*; Johnson, J. A. * ACS Macro Lett. 2019, 8, 473-478. Lamb, J. R.; Qin, K. P.; Johnson, J. A. * Polym. Chem. 2019, 10, 1585-1590. Lin, T.-S.; Wang, R.; Johnson, J. A.; Olsen, B. D.* Macromolecules 2019, 52, 1685-1694. MacLeod, M. J.; Goodman, A. J.; Ye, H.; Nguyen, H. V.-T.; Van Voorhis, T.; Johnson, J. A. * Nat. Chem. 2019, 11, 57-63. "Surface anchors target golden bullets." 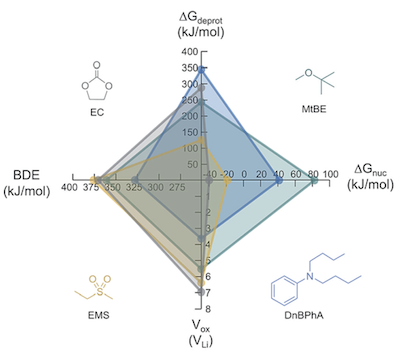 Nature Chemistry New & Views 2019, 11, 20-22. Shibuya, Y.; Tatara, R.; Jiang, Y.; Shao-Horn, Y.; Johnson, J. A. * J. Polym. Sci. A 2019, 57, 448-455. Golder, M. R.; Nguyen, H. V.-T.; Oldenhuis, N. J.; Grundler, J.; Park, E. J.; Johnson, J. A. * Macromolecules 2018, 51, 9861-9870. Nguyen, H. V.-T.†; Detappe, A.†; Gallagher, N. M.; Zhang, H.; Harvey, P.; Yan, C.; Mathieu, C.; Golder, M. R.; Jiang, Y.; Ottaviani, M. F.; Jasanoff, A.; Rajca, A.; Ghobrial, I. M.; Ghoroghchian, P. P.*; Johnson, J. A. * ACS Nano 2018, 12, 11343-11354. Gu, Y.; Schauenburg, D.; Bode, J. W.*; Johnson, J. A. * J. Am. Chem. Soc. 2018, 140, 14033-14037. Zhang, W.; Huang, M.; Al-Abdullatif, S.; Chen, M.; Shao-Horn, Y.; Johnson, J. A. * Macromolecules 2018, 51, 6757-6763. Feng, S.; Lunger, J. R.; Johnson, J. A.; Shao-Horn, Y. * Science 2018, 361, 758. Golder, M. R.†; Liu, J.†; Andersen, J. N.; Shipitsin, M. V.; Vohidov, F.; Nguyen, H. V.-T.; Ehrlich, D. C.; Huh, S. J.; Vangamudi, B.; Economides, K. D.; Neenan, A. M.; Ackley, J. C.; Baddour, J.; Paramasivan, S.; Brady, S. W.; Held, E. J.; Reiter, L. A.; Saucier-Sawyer, J. K.; Kopesky, P. W.; Chickering, D. E.; Blume-Jensen, P.*; Johnson, J. A. * Nat. Biomed. Eng. 2018, 2, 822-830. Deming, T. J. *; Klok, H.-A. *; Armes, S. P.; Becker, M. L.; Champion, J. C.; Chen, E. Y.-X. ; Heilshorn, S. C.; van Hest, J. C.-M.; Irvine, D. J.; Johnson, J. A.; Kiessling, L. L.; Maynard, H. D.; Olvera de la Cruz, M.; Sullivan, M. O.; Tirrell, M. V.; Anseth, K. S.; Lecommandoux, S.; Percec, S.; Zhong, Z.; Albertsson, A.C. Biomacromolecules 2018, 19, 3151-3162. Gu, Y.; Alt, E. A.; Wang, H.; Li, X.; Willard, A. P.; Johnson, J. A. * Nature 2018, 560, 65-69. "Light-controlled polymers can switch between sturdy and soft." MIT News 2018, July 18th. Qiao, B. *; Leverick, G. M.; Zhao, W.; Flood, A. H.; Johnson, J. A. *; Shao-Horn, Y. J. Am. Chem. Soc. 2018, 140, 10932-10936. "Supramolecular complex liberates lithium." C&E News 2018, 96 (30). "Supramolecular recognition increases battery electrolyte conductivity." JACS Spotlights 2018, 140, 10383-10384. Cheng, L.; Gadelrab, K.; Kawamoto, K.; Yager, K.; Johnson, J. A.; Alexander-Katz, A.; Ross, C. A. Nano Lett. 2018, 18, 4360-4369. Guo, Z.; Le, A. N.; Feng, X.; Choo, Y.; Liu, B.; Wang, D.; Wan, Z.; Gu, Y.; Zhao, J.; Li, V.; Osuji, C.; Johnson, J. A. *; Zhong, M.* Angew. Chem. Int. Ed. 2018, 57, 8493-8497. Rokhlenko, Y.†; Kawamoto, K.†; Johnson, J. A. *; Osuji, C. O. * Macromolecules 2018, 51, 3680-3690. Gallagher, N. M.; Zhukhovitskiy, A. V.; Nguyen, H. V.-T.; Johnson, J. A. * Macromolecules 2018, 51, 3006-3016. "Supramolecular polymers with a zwitterionic backbone." Synfacts 2018, 14, 0699. Nguyen, H. V.-T.; Gallagher, N. M.; Vohidov, F.; Jiang, Y.; Kawamoto, K.; Zhang, H.; Park, J. V.; Huang, Z.; Ottaviani, M. F.; Rajca, A.; Johnson, J. A. * ACS Macro Lett. 2018, 7, 472-476. Huang, M.; Feng, S.; Zhang, W.; Giordano, L.; Chen, M.; Amanchukwu, C.; Anandakathir, R.; Shao-Horn, Y. *; Johnson, J. A. * Energy Environ. Sci. 2018, 11, 1326-1334. Wang, J.; Lin, T.-S.; Gu, Y.; Wang, R.; Olsen, B. D.*; Johnson, J. A. * ACS Macro Lett. 2018, 7, 244-249. Golder, M. R.†; Jiang, Y.†; Teichen, P. E.; Nguyen, H. V.-T.; Wang, W.; Milos, N.; Freedman, S. A.; Willard, A. P.; Johnson, J. A. * J. Am. Chem. Soc. 2018, 140, 1596-1599. Lin, T.-S.; Wang, R.; Johnson, J. A.; Olsen, B. D.* Macromolecules 2018, 51, 1224-1231. Wang, R.; Lin, T.-S.; Johnson, J. A.; Olsen, B. D.* ACS Macro Lett. 2017, 6, 1414-1419. Feng, S.†; Chen, M.†; Giordano, M.; Huang, M.; Zhang, W.; Amanchukwu, C. V.; Anandakathir, R.; Shao-Horn, Y. *; Johnson, J. A. * J. Mater. Chem. A 2017, 5, 23987-23998. Shibuya, Y.; Nguyen, H. V.-T.; Johnson, J. A. * ACS Macro Lett. 2017, 6, 963-968. MacLeod, M. J.; Johnson, J. A. * Polym. Chem. 2017, 8, 4488-4493. "Paper of the month" Polymer Chemistry Blog. 2017, August 22nd. Nguyen, H. V.-T.; Chen, Q.; Paletta, J. T.; Harvey, P.; Jiang, Y.; Zhang, H.; Boska, M. D.; Ottaviani, M. F.; Jasanoff, A.; Rajca, A.; Johnson, J. A. * ACS Cent. Sci. 2017, 3, 800-811. "Metal-free MRI contrast agent could be safer for some patients" MIT News 2017, July 12th. "Building a better magnetic resonance imaging contrast agent using macromolecular architecture" ACS Cent. Sci. 2017, 3, 820-822. Gu, Y.; Kawamoto, K.; Zhong, M.; Chen, M.; Hore, M. J.A. ; Jordan, A. M.; Korley, L. T.J.; Olsen, B. D.; Johnson, J. A. * Proc. Natl. Acad. Sci. U.S.A. 2017, 114, 4875-4880. "New strategy produces stronger polymers" MIT News 2017, April 24th. Wang, R.; Johnson, J. A.; Olsen, B. D.* Macromolecules 2017, 50, 2556-2564. Chen, M.; Deng, S.; Gu, Y.; Lin, J.; MacLeod, M. J.; Johnson, J. A. * J. Am. Chem. Soc. 2017, 139, 2257-2266. Singh, A.; Kuksenok, O.; Johnson, J. A.; Balazs, A. C.* Soft Matter 2017, 13, 1978-1897. Chen, M.†; Gu, Y.†; Singh, A.; Zhong, M.; Jordan, A. M.; Biswas, S.; Korley, L. T.J.; Balazs, A. C.; Johnson, J. A. * ACS Cent. Sci. 2017, 3, 124-134. "Living additive manufacturing" ACS Cent. Sci. 2017, 3, 95-96. "Technique enables adaptable 3-D printing" MIT News 2017, January 13th. "New 'living additive manufacturing' technique enables fusion, chemical alteration of 3D printed materials" 3Ders.org 2017, January 13th. "MIT chemists develop new technique that enables adaptable 3D printing" Azo Materials 2017, January 16th. "3D printing technique lets you change an object's colour using light" Wired Magazine 2017, January 17th. "MIT develops 3-D printing 'undo' option" The Christian Science Monitor 2017, January 18th. Wang, Y.; Gu, Y.; Keeler, E. G.; Park, J.; Griffin, R. G.; Johnson, J. A. * Angew. Chem. Int. Ed. 2017, 56, 188-192. Barnes, J. C.†; Bruno, P. M.†; Nguyen, H. V.-T.; Liao, L.; Liu, J.; Hemann, M. T.; Johnson, J. A. * J. Am. Chem. Soc. 2016, 138, 12494-12501. Click here to read the open access article. "High-capacity nanoparticle" MIT News 2016, September 14th. Zhong, M.†; Wang, R.†; Kawamoto, K.†; Olsen, B. D.*; Johnson, J. A. * Science 2016, 353, 1264-1268. "New theory overcomes a longstanding polymer problem" MIT News 2016, September 15th. "New theory overcomes a longstanding polymer problem" Chemeurope.com 2016, September 20th. Zhukhovitskiy, A. V.; Zhao, J.; Zhong, M.; Keeler, E. G.; Alt, E. A.; Teichen, P.; Griffin, R. G.; Hore, M. J. A.; Willard, A. P.; Johnson, J. A. * Macromolecules 2016, 49, 6896-6902. Kawamoto, K.; Zhong, M.; Gadelrab, K. R.; Cheng, L.-C.; Ross, C. A.; Alexander-Katz, A.; Johnson, J. A. * J. Am. Chem. Soc. 2016, 138, 11501-11504. Wang, Y.; Zhong, M.; Park, J. V.; Zhukhovitskiy, A. V.; Johnson, J. A. * J. Am. Chem. Soc. 2016, 138, 10708-10715. Jiang, Y.; Golder, M. R.; Nguyen, H. V.-T.; Wang, Y.; Zhong, M.; Barnes, J. C.; Ehrlich, D. J. C.; Johnson, J. A. * J. Am. Chem. Soc. 2016, 138, 9369-9372. Zhukhovitskiy, A. V.; Mavros, M. J.; K.T. Queeney; Wu, T.; Van Voorhis, T.; Johnson, J. A. * J. Am. Chem. Soc. 2016, 138, 8639-8652. "N-heterocyclic carbenes aminate silicon surfaces" C&E News 2016, 946, 10. Wang, R.; Alexander-Katz, A.; Johnson, J. A. *; Olsen, B. D.* Phys. Rev. Lett. 2016, 1166, 188302-1-5. Singh, A.; Kuksenok, O.; Johnson, J. A. *; Balazs, A. C.* Polym. Chem. 2016, 76, 2955-2964. Chen, M.†; Zhong, M.†; Johnson, J. A. * Chem. Rev. 2016, 116, 10167-10211. Zhukhovitskiy, A. V.; Zhong, M.; Keeler, E. G.; Michaelis, V. K.; Sun, J. E.P. ; Hore, M. J. A.; Pochan, D. J.; Griffin, R. G.; Willard, A. P.; Johnson, J. A. * Nature Chem. 2016, 8, 33-41. "Hybrid material flexes its muscles" Chemical and Engineering Progress 2015, 111, 7. 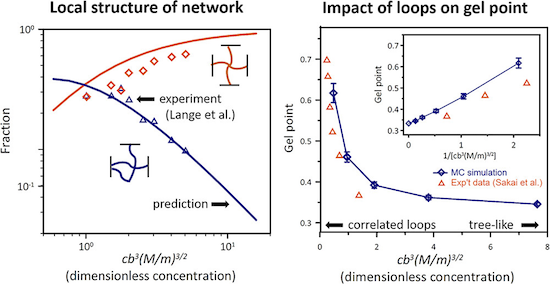 "Metal-organic networks go elastic" C&E News 2015, 93, 27. "Chemists create adaptable metallic-cage gels" MIT News 2015, November 17th. "Chemists create adaptable metallic-cage gels" Chemeurope.com 2015, November 20th. Kawamoto, K.; Zhong, M.; Wang, R.; Olsen, B. D.*; Johnson, J. A. * Macromolecules 2015, 48, 8980-8988. Zhukhovitskiy, A. V.; MacLeod, M. J.; Johnson, J. A. * Chem. Rev. 2015, 115, 11503-11532. Barnes, J. C.; Ehrlich, D. J.-C.; Gao, A. X.; Leibfarth, F. A.; Jiang, Y.; Zhou, E.; Jamison, T. F.; Johnson, J. A. * Nature Chem. 2015, 7, 810-815. "Iterative Exponential Growth of Stereo- and Sequence-Controlled Polymers" Synfacts 2016, 12, 0037. "Click chemistry creates precision polymers" RSC Chemistry World 2015, September 8th. Leibfarth, F. A.; Johnson, J. A. *; Jamison, T. F.* Proc. Natl. Acad. Sci. U.S.A. 2015, 112, 10617-10622. 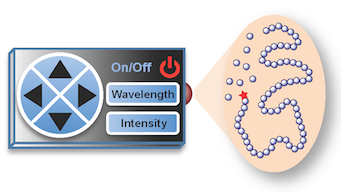 "Semiautomated Route to Defined Polymers" C&E News 2015, 93, 5. "Automated Flow Technique Makes Length- And Sequence-Specific Polymers" C&E@ACS Boston 2015, August 19th. MacLeod, M. J.; Johnson, J. A. * J. Am. Chem. Soc. 2015, 137, 7974-7977. Chen, M.; MacLeod, M. J.; Johnson, J. A. * ACS Macro Lett. 2015, 4, 566-569. Kawamoto, K.; Grindy, S. C.; Liu, J.; Holten-Andersen, N.; Johnson, J. A. * ACS Macro Lett. 2015, 4, 458-461. Chen, M.; Johnson, J. A. * Chem. Commun. 2015, 51, 6742-6745. Zhukhovitskiy, A. V.; Geng, J.; Johnson, J. A. * Chem. Eur. J. 2015, 21, 5685-5688. "Cover Profile" Chem. Eur. J. 2015, 21, 5649. Sowers, M. A.; McCombs, J. R.; Wang, Y.; Paletta, J. T.; Morton, S. W.; Dreaden, E. C.; Boska, M. D.; Ottaviani, M. F.; Hammond, P. T.; Rajca, A.; Johnson, J. A. * Nature Commun. 2014, 5, 1-9, doi: 10.1038/ncomms6460. "Two Sensors In One" MIT News 2014, November 18th. "Organic, Non-toxic Sensor Allows Dual MRI and Fluorescent Imaging" NIH NIBIB Science Highlight 2015, March 2nd. Gao, A. X.; Liao, L.; Johnson, J. A. * ACS Macro Lett. 2014, 3, 854-857. Zhou, H.; Schön, E.-M.; Wang, M.; Glassman, M. J.; Liu, J.; Zhong, M.; Díaz, D. D.; Olsen, B. D.; Johnson, J. A. * J. Am. Chem. Soc. 2014, 136, 9464-9470. Liao, L.; Liu, J.; Dreaden, E. C.; Morton, S. W.; Shopsowitz, K. E.; Hammond, P. T.; Johnson, J. A. * J. Am. Chem. Soc. 2014, 136, 5896-5899. "Nanoparticles Deliver Three Cancer Drugs to Tumors" C&E News 2014, 19, 9. "Nanoparticles Serve Up Calibrated Cocktails To Treat Cancer" JACS Spotlights 2014, 136, 6511. "Targeting Cancer with a Triple Threat" MIT News 2014, April 15th. "Trois Anticancéreux Dans Une Nanoparticule" Le Monde 2014, April 21st. "New Nanoparticles Can Deliver Three Cancer Drugs at Once" Business Standard 2014, April 16th. "Super Cancer-fighting Nanoparticle Built Like a Lego Set" Qmed 2014, April 15th. "Nanoparticles Deliver Three Cancer Drugs at Once" I. F. L. S. 2014, April 15th. "Drug-delivering Nanoparticles Pose a Triple Threat to Cancer" Gizmag 2014, April 16th. "MIT researchers create polymer nanoparticle for cancer drug delivery" in-Pharma Technologist.com 2014, May 15th. "Revolutionary Nanoparticle Based Drug Delivery - Targeted Cancer Therapeutics Interview" SelectScience 2014, June 10th. "Targeting cancer with a triple threat: new nanoparticles can deliver three drugs at once" ScienceDaily 2014, April 15th. Burts, A. O.; Gao. A. X.; Johnson, J. A. * Macromol. Rap. Commun. 2014, 35, 168-173. Burts, A. O.; Liao, L.; Lu, Y. Y.; Tirrell, D. A.; Johnson, J. A. * Photochem. Photobiol. 2014, 90, 380-385. Cok, A. M.; Zhou, H.; Johnson, J. A. * Macromol. Symp. 2013, 329, 108-112. Zhukhovitskiy, A. V.; Mavros, M. G.; Van Voorhis, T.; Johnson, J. A. * J. Am. Chem. Soc. 2013, 135, 7418-7421. "Carbene For Gold Surfaces" C&E News: News of the Week 2013, 91, 11. "A New Kind of Chemical Glue" MIT News 2013, May 29th. Zhou, H.; Johnson, J. A. * Angew. Chem. Int. Ed. 2013, 52, 2235-2238. "Polymer Chemistry: Rooftop Reactions" Nature Chemistry 2013, 5, 366-368. "Light Makes Pores in Polymer Gel Bigger" Materials 360 2013, May 15th. "Pores for Thought: Just Shine a Light" Spectroscopy NOW 2013, February 15th. Olsen, B. D.; Johnson, J. A. * Proc. Natl. Acad. Sci. U.S.A. 2013, 110, E1973. Li, W.; Chung, H.; Daeffler, C.; Johnson, J. A. *; Grubbs, R. H.* Macromolecules 2012, 45, 9595-9603. Zhou, H.; Woo, J.; Cok, A. M.; Wang, M.; Olsen, B. D.; Johnson, J. A. * Proc. Natl. Acad. Sci. U.S.A. 2012, 109, 19119-19124. 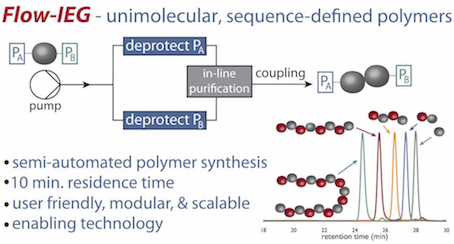 "Polymer Chemistry: Wasted Loops Quantified" Nature 2013, 493, 172-173. 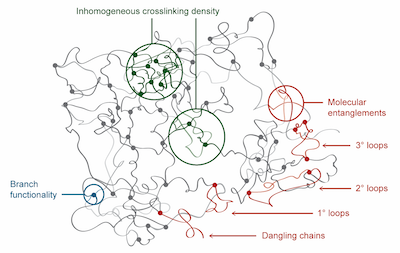 "Counting Loops in Gels" Nature 2012, 491, 304-305. 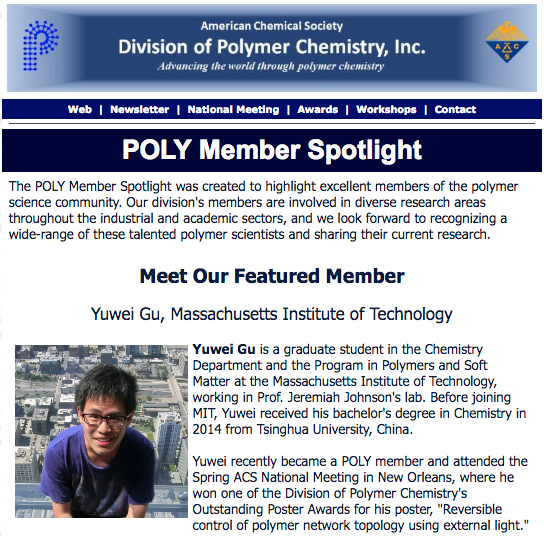 "A Step Toward Stronger Polymers" MIT News 2012, November 5th. Liu, J.; Burts, A. O.; Li, Y.; Zhukhovitskiy, A. Z.; Ottaviani, M. F.; Turro, N. J.; Johnson, J. A. * J. Am. Chem. Soc. 2012, 134, 16337-16344. "Synthesis of Photocleavable Star Polymers by the 'Brush-First' Method" Synfacts 2012, 8, 1321. Burts, A. O.; Li, Y.; Zhukhovitskiy, A. Z.; Patel, P. R.; Grubbs, R. H.; Ottaviani, M. F.; Turro, N. J.; Johnson, J. A. * Macromolecules 2012, 45, 8310-8318. Xia, Y.; Li, Y.; Burts, A. O.; Ottaviani, M. F.; Tirell, D. A.; Johnson, J. A. *; Turro, N. J. *; Grubbs, R. H.* J. Am. Chem. Soc. 2011, 133, 19953-19959. Johnson, J. A.; Lu, Y.-Y. ; Burts, A. O.; Lim, Y.-H.; Finn, M. G.; Koberstein, J. T.; Turro, N. J.; Tirrell, D. A.; Grubbs, R. H. J. Am. Chem. Soc. 2011, 133, 559-566. Johnson, J. A.; Lu, Y. Y.; Burts, A. O.; Xia, Y.; Durrell, A. C.; Tirrell, D. A.; Grubbs, R. H. Macromolecules 2010, 43, 10326-10335. Johnson, J. A.; Lu, Y. Y.; Van Deventer, J. A.; Tirrell, D. A. Curr. Opion. Chem. Biol. 2010, 14, 774-780. Johnson, J. A.; Baskin, J. M.; Bertozzi, C. R.; Koberstein, J. T.; Turro, N. J. Chem. Commun. (Cambridge, U. K.) 2008, 3064-3066. Johnson, J. A.; Finn, M. G.; Koberstein, J. T.; Turro, N. J. Macromol. Rapid Commun. 2008, 29, 1052-1072. Johnson, J. A.; Finn, M. G.; Koberstein, J. T.; Turro, N. J. Macromolecules 2007, 40, 3589-3598. Johnson, J. A.; Lewis, D. R.; Diaz, D. D.; Finn, M. G.; Koberstein, J. T.; Turro, N. J. J. Am. Chem. Soc. 2006, 128, 6564-6565.